The most beautiful women I have known during my 43 years on Earth have all had one thing in common: at any given time, they showed their vintage. Race, background, nationality, social and economic standing, education, sense of style were all different, and nothing else was a commonality except that during the time I knew them they were completely transparent when it came to where they were in their life. The idea of avoiding humiliation or seeking outside approval did not stop them from leading with an open heart… they talk openly about their faults, let every wrinkle and blemish shine to the sky, proudly walk in a body that had more problems some years than others yet it was all part of their vintage story, and they knew that if they spent their time trying to hide every little flaw then they couldn’t give joy and love to the world. A person in their presence would feel what they had survived, what they had sacrificed to take care of others; it was a beauty so deep that no photo or description could do it justice. 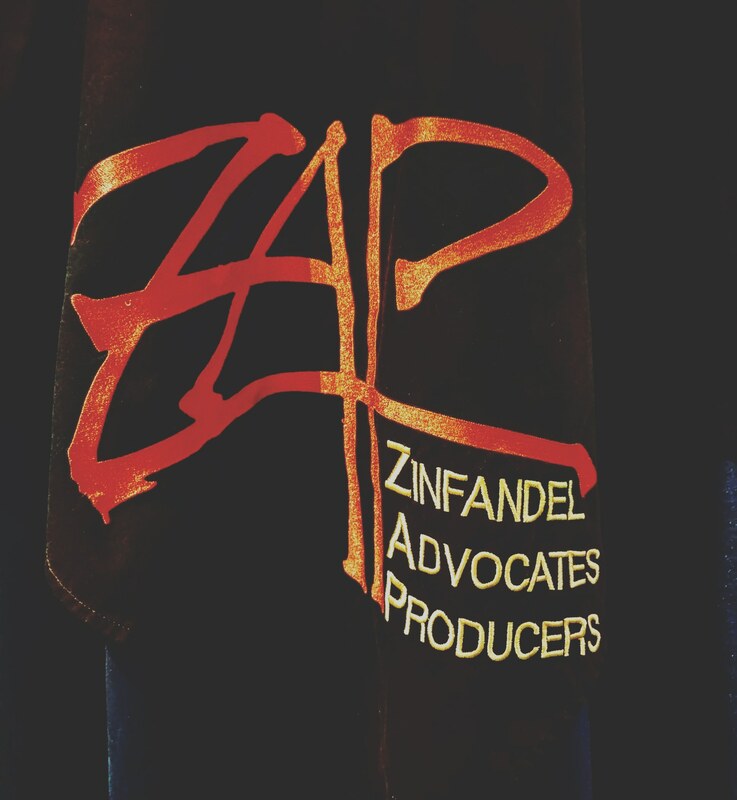 In the beginning of June, I attended a Zinfandel Advocates & Producers (ZAP) seminar where five legendary Zin producers poured wines from single vineyards coming from 4 different areas, aka American Viticultural Areas (AVAs): Paso Robles, Napa Valley, Russian River Valley, and Dry Creek Valley. It was one of those riveting conversations where I knew that this was a living history of one of the most misunderstood grape varieties which the US made their own. 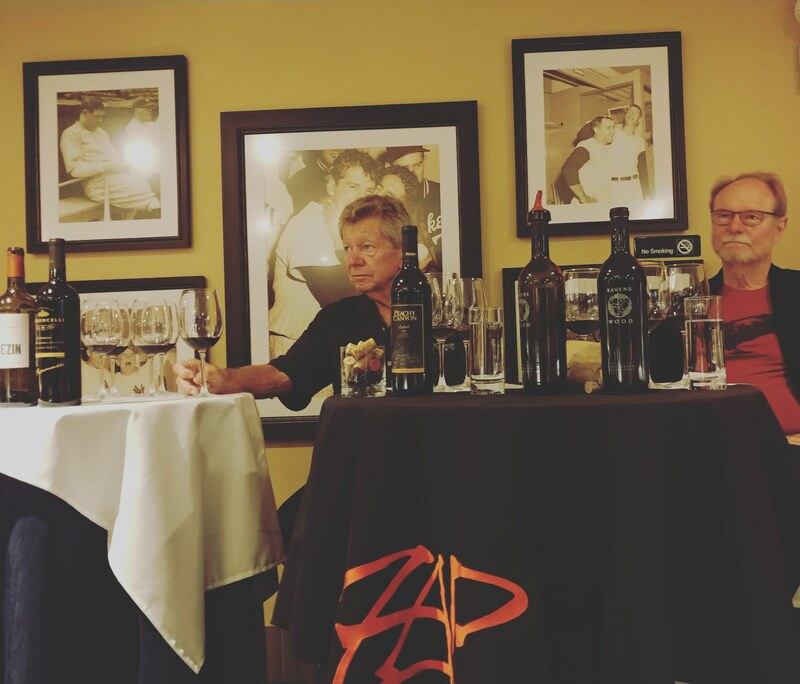 Joel Peterson, founder of Ravenswood, and Doug Beckett, owner of Peachy Canyon Winery, kicked it off with the colorful history of the Zinfandel clone and the many decades of research that it took to match it to an ancient variety called Tribidrag, as well as other names, that records suggest was a wine enjoyed by Venetian nobility as early as the 1400s. Evidence pointed to its origins in Kaštela, Croatia – although those from the Balkan country Montenegro make a good case as its homeland; but geneticist Dr. Carole Meredith, the American who helped connect Tribidrag to Zinfandel with two Croatian colleagues, said that despite not knowing the grape’s exact origins, it seems most probable to come from somewhere along the Adriatic coast, and that some top grape geneticists believe it may be one of the 13 founder grapes from which all other grapes can be traced back. Many of us are told that if we live a certain life and go about it in a particular way we will be happy, fulfilled, without serious bumps in the road… that is not true for many of us… there are things others never tell us (as they are hiding their own humiliation or pain) as the rug can be pulled out from under us in a multitude of ways. Life doesn’t go the way we plan, no matter if we were given a good start in life or not. Our first reaction is to cling to our youth for a chance to restart again – I think that is why there are so many products sold to make us look or feel young, so we can feel like we are reliving our life; but at the end of the day, it just creates more of an empty void of chasing an impossible goal that gets farther and farther with each year. I think the secret to life is not making sure to check off certain boxes, because it will never turn out exactly the way we wanted it to… but it is the surrender to where we are right here and now. We do not shy away from our wrinkles, our bodies that have racked up miles, an overwhelmed mind that has witnessed lots of pain, anger, sadness as well as joy… we don’t try to be the outstanding vintage year after year, as that just gets too exhausting – life is really thrilling on its own, we just need to surrender to it. This really hit home when Joel Peterson talked about the vineyard history of the wine he was pouring… it was called Dickerson because, for many years, it was owned by Bill Dickerson, a man Joel had known since he was 13 years old, who was regular at his father’s wine tasting group, who unexpectedly died in the tsunami caused by the Indian Ocean earthquake in 2004 while Bill and his wife were vacationing in Phuket, an island in Thailand. In that moment I flashed back to 2006 on my honeymoon in Thailand, two years after the tsunami, walking on the beach in Phuket with a local talking to us about how quickly the huge tidal wave came without warning and how it destroyed many lives… and then it went back into the ocean just as quickly as it had appeared. The devastation was still obvious and the sense of shock among those who still lived in the area was evident. Life is precious and when it will come to be our turn to pass, it will not be the polished moments that people who are close to us will remember… it will be the messy, complicated, vulnerable moments that were not about making ourselves look good, but were about connecting with those around us. 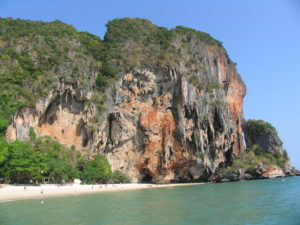 ***The first photo was taken by my husband during our Honeymoon of the south west of Thailand near Phuket. –2016 Peachy Canyon Winery, Willow Creek District, Paso Robles AVA, California: 100% Zinfandel. Owner Doug Beckett briefly talked about the 3 districts in Paso Robles that has significance in his mind: Adelaida, Templeton Gap, and Willow Creek – although the grapes for this wine are bought from another long standing vineyard, he is in the process of buying a vineyard in Willow Creek so Peachy Canyon Winery will have vineyards in each of these AVAs and they can expand their single vineyard program. 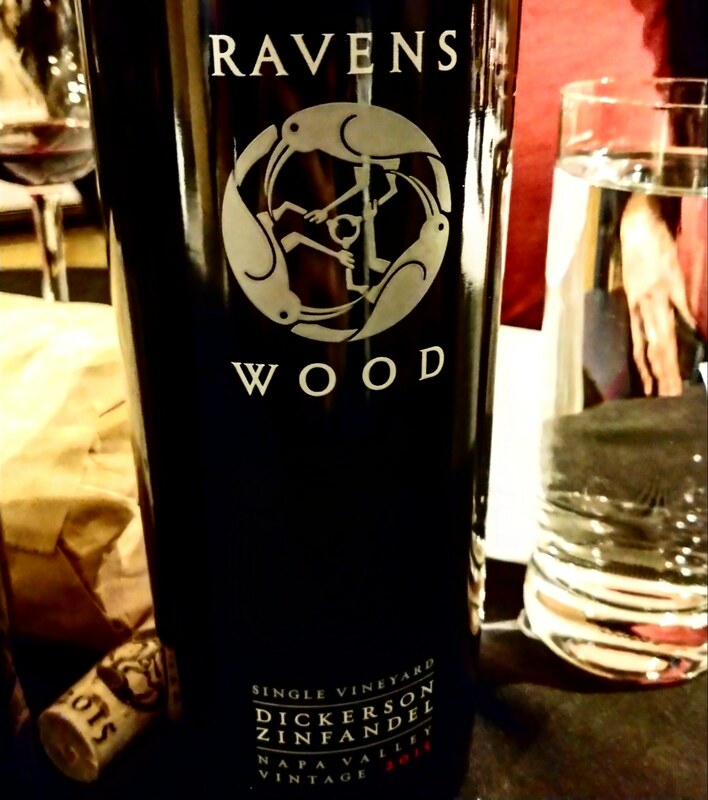 Doug said that Willow Creek (with more mountains, higher rainfall) gives a more restrained, fresher wine that he prefers in their youth and in general he said he liked drinking Zinfandel young – but Ravenswood’s Joel Peterson jumped in and said he was drinking various Zinfandels from 1990-1997 and that they were delicious. Doug is a big believer in dry-farming (non-irrigated vineyards) and many of his vineyards follow that practice. This wine had juicy black cherry and spice with hints of scorched earth and a touch of white pepper with round tannins and plenty of acidity to make it a good pairing with a diverse array of foods. Only 400 cases made. 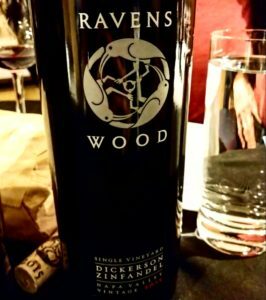 –2015 Ravenswood Winery, Dickerson Vineyard, Napa Valley AVA, California: 100% Zinfandel. 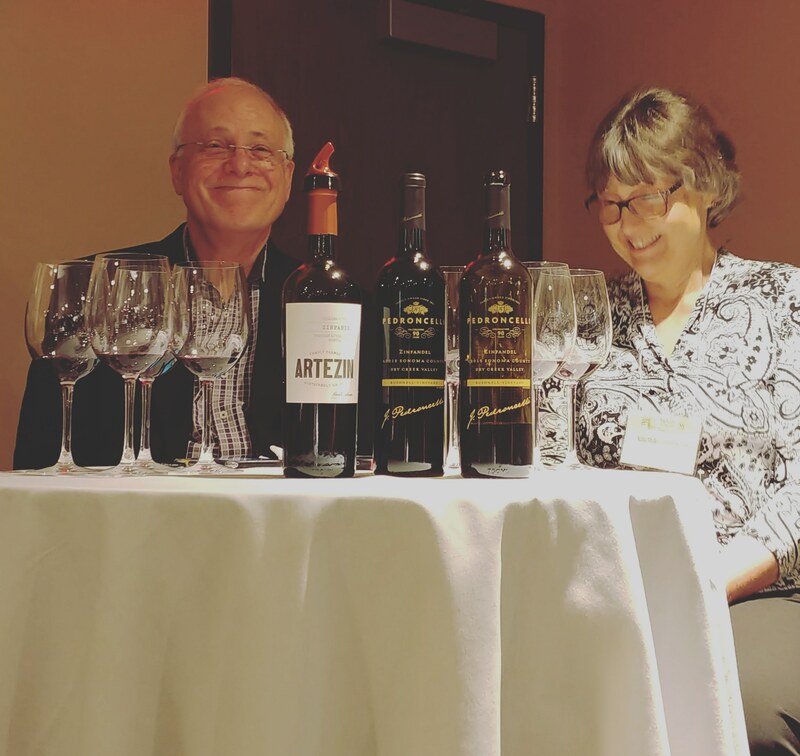 Founder Joel Peterson passionately spoke about his strong belief in the ageability of Zinfandel, and again, he was currently drinking many from the 1990s and finding them in fantastic shape. 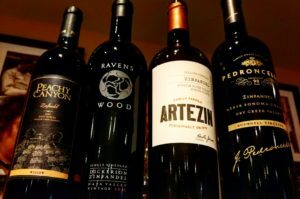 He said that if Zinfandel is made to age, not too ripe or watered back and it gets to the point where you can ferment it dry, it will have energy and vibrancy left, but if the energy has been taken out, it will have problems aging. This vineyard, once owned by his late friend Bill Dickerson, was passed on to Bill’s daughters but eventually sold to owners of Pinterest, which was fine with him as it would take someone with major resources to keep a vineyard in Napa with old vine Zinfandel (originally planted in 1920) as Cabernet Sauvignon growers are getting 3x, up to 4x, more for their grapes grown just up the street. The vitality jumped out of this wine with high-toned red raspberries and vibrant floral notes, very aromatic, with some dried herbs and good structure with drive that gave it a long finish and indicates that this beauty will age with grace in the long term. Only 800 cases made. Also, a couple of fun side notes… this vineyard is head-pruned (as well as dry-farmed), as the previous Willow Creek, because Zinfandel has larger clusters that sit on each other so trellising takes a lot of work and that is why many high-quality Zinfandel producers in California prefer head-pruned. The Dickerson vineyard was planted on leafroll affected rootstocks – and so the leafroll rootstock affects the metabolic character of the vine so it gets less photosynthetic capacity (processes light less efficiently) and so takes a lot longer to ripen – the acid stays up and the fruit stays within the red raspberry spectrum as opposed to many of the other Napa Zinfandel vineyards having more of a plummy note. 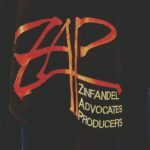 And finally, in 1960, the most grown grape in Napa was Petite Sirah but Zinfandel was a close second so it was well-liked in Napa – but today Zinfandel only makes up 2% of the vineyards in Napa Valley. –2015 Artezin, Collins Vineyard, Russian River Valley AVA, California: 96% Zinfandel and 4% Carignane (Carignan). 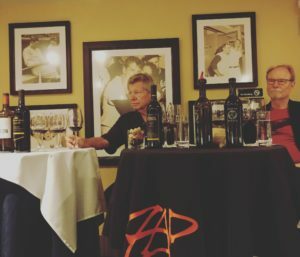 Winemaker Randle Johnson talked about the Collins family and their illustrious history with their Limerick Lane Winery and although the vineyards were sold off Michael Collins kept 8 acres (3.2 hectares), planted in 1934, and Artezin is fortunate enough to get half of those grapes to make this wine. Randle calls this a “tangent” wine as it does not have the “classic Zinfandel” characteristics such as the black pepper but it does have the red fruit, boysenberry deliciousness going on. He makes another Zin from Dry Creek which he said is classic. 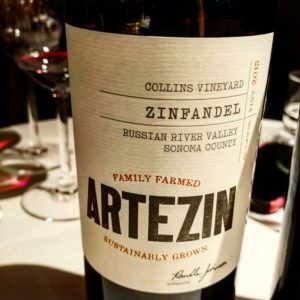 His Collins Vineyard in RRV and his Dry Creek just showed the sliver of the broad breadth of versatility that Zinfandel is capable of. Crunchy red fruit with lilacs and bay leaf with fine tannins and an overall lightness of being while being concentrated at the same time. Only 400 cases. 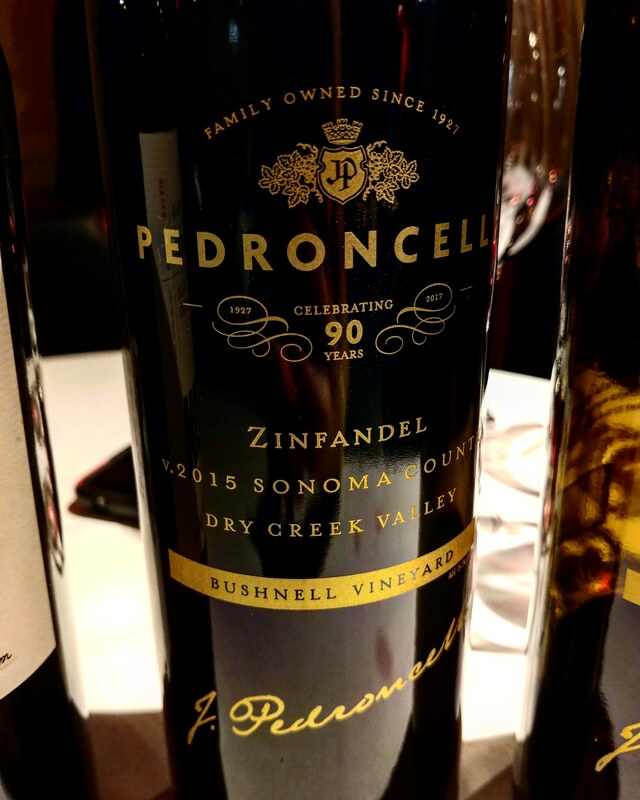 –2015 Pedroncelli, Bushnell Vineyard, Dry Creek Valley AVA, California: 97% Zinfandel and 3% Petite Sirah. Again, owner Julie Pedroncelli St. John’s family has been growing Zinfandel in Dry Creek for 90 years – going back 4 generations. Julie said the Pedroncelli wine style has always been Old World in style with a California twist. They grow hillside Zinfandel, both at their original 25 acres (10.1 hectares) of vineyards around their home ranch and this Bushnell vineyard is in the middle of Dry Creek Valley up on a hill, and it is considered an extension of the original vineyards; it was owned by her grandfather in the 1940s (they think it was planted around 1919 and re-planted in the 1990s), sold to his son-in-law and daughter in the 1950s, and they farmed it until 1990s and then Julie’s cousin Carol and her husband Jim Bushnell have tended the vineyard ever since. Wild strawberries with baking spice and a hint of cocoa dust with deep concentration and textural complexity finishing with a note of black pepper. Only 1000 cases. Also, interesting side notes… since Julie’s grandparents grew wine grapes 90 years ago they did have to suffer through Prohibition but found a way to survive by selling grapes to the head of households so they could make their own wine and it is still one of the few things not taxed in the US – up to 200 gallons. 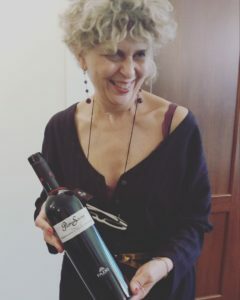 An the current winemaker, Montse Reece, likes to use yeast commonly used in Barolo because it is nice and slow and so pulls out a lot of nuances from the Zinfandel variety. Jean-Christophe Mau’s voice was filled with shock and sadness, yet determination to find a way to survive. It was during my lunch with him back in May, a lunch that included having him talk through a cell phone, on speaker, raised up above our table at a famous seafood place in Manhattan, New York City, called Docks. Just a few days earlier, one of the worst hailstorms in Bordeaux’s recent history came down fiercely, as only Mother Nature can do, with golf ball sized ice that decimated everything in their path. The lucky, and the unlucky, were decided within a matter of 15 minutes and when it was all over, Jean-Christophe, owner and manager of Château Brown, said that 50% to 70% of his vines were damaged. As one can imagine, in that instance, Jean-Christophe had the weight of the world on his shoulders, and despite all of the New York City wine buyers and writers at that table understanding the gravity of the situation when we heard the news, he was still insistent on calling us and apologized profusely… he said that there were few things that could keep him from his NYC visit and unfortunately one of those unfathomable things happened. 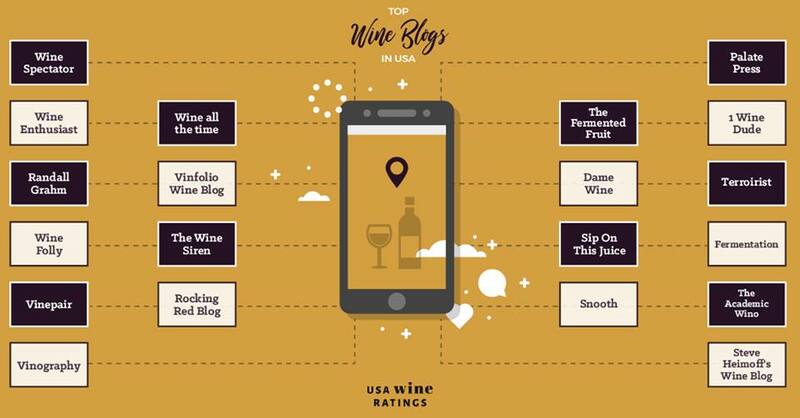 I have been around wine, talking and learning about it seriously, for almost 25 years… starting when I was a naïve 18 year old fresh “off the boat”, or my case a cheap plane flight, in NYC surrounded by people who knew a lot more than myself. Through the years I have learned a lot, as well as un-learned some things that have led me astray, as facts not only have a way of evolving and altering, but also, many of these facts were lacking a perspective in humanity. 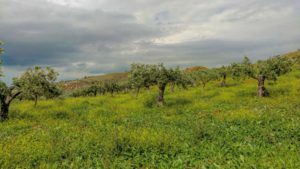 Over the years, my frustrations at finding the same sort of prejudices and unfair generalizations that plague societies seep into wine as well made me get to the point where I no longer enjoyed wine… either I was going to leave it or I was going to start bringing the humanity back to it. 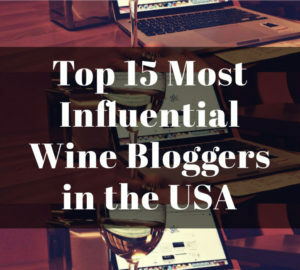 I have to admit that I, shamefully, have said many ignorant things about wine in the past while trying to impress those who were more well-traveled, educated, and sophisticated than I was. Something deep down inside me, though, knew that it was not right to make similar sweeping statements about people – once we start to pick and chose who gets a fair shake at humanity, such as those who succeed get the negative sensational slant and those that are the downtrodden get an positive in-depth character analysis, we become no better than those strangers who throw unkind, biased words our way. In turn, we become part of the problem of deciding to take the humanity out of the discussion when it fits our purpose. 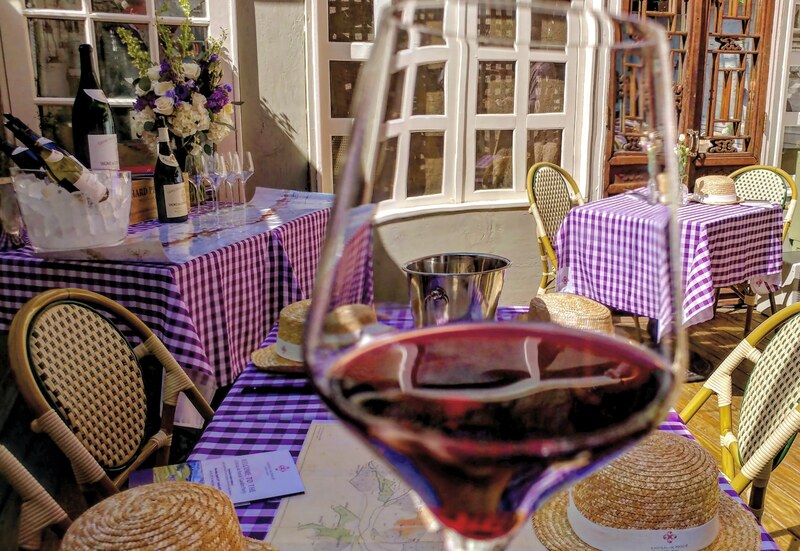 Bordeaux has been the latest casualty of the unfair generalities in the world of wine. 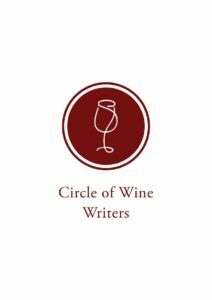 It is a warm, inviting place filled with many quality wine producers trying to create the best wine within a fair price point, but the flood of articles, year in year out, focusing on 1% of the most expensive wines – whether to praise them or demonize them – get placed into a group message about a pretentious Bordeaux. I understand that writing quality fair and balanced work is becoming an endangered species: unless there is an angle to it that is click bait, no one is going to see it; publications are facing the dire choice between writing well-balanced articles and potentially going out of business and writing something a bit more controversial and surviving – hoping that readers will be able to keep it in perspective on their own. 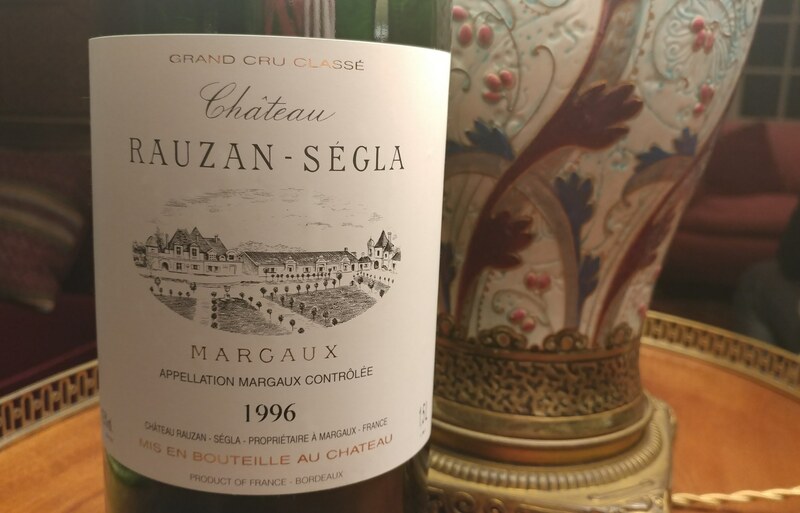 So Bordeaux wines have become one of those easy, controversial tropics – accusations about their greed and lack of excitement are over-exaggerated while the producers making soulful wines at an attainable price have to spend too much time trying to defend themselves in export markets. 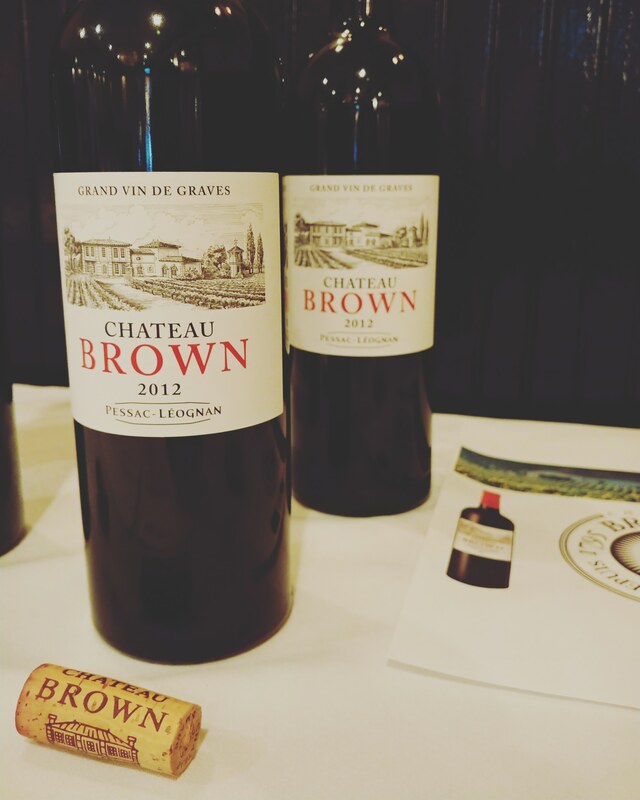 Château Brown is one of those wine producers… located in the heart of Bordeaux white wine country, Pessac-Léognan in Graves. 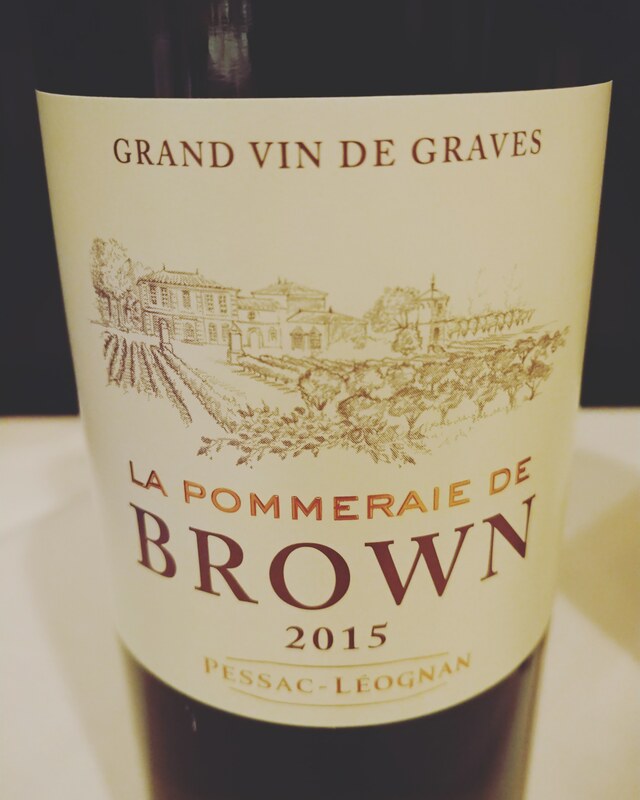 The name may seem odd for a French wine producer but “Brown” pays respect to the Scottish wine trader, John Lewis Brown, who settled in Bordeaux shortly after the Revolution, in 1795, and bought a wine estate that was dated to have vines there since the 12th century. 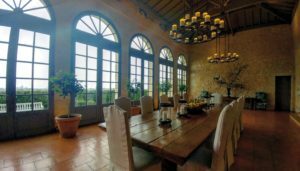 The Mau family has owned Château Brown since 2004, and despite not being part of the Brown lineage, they share the founder’s passion for placing a great amount of resources, time and energy into their vineyards as well as the winery. Their top white Château Brown sells out almost every year because of their fair pricing in combination with the reputation of the area; their often times overlooked reds and second wines have a beautiful finesse, generosity of fruit with good precision which illustrates how these wines have come a long way in their quality while staying true to the heartbeat of this château – managing vines that ultimately create elegant wines. 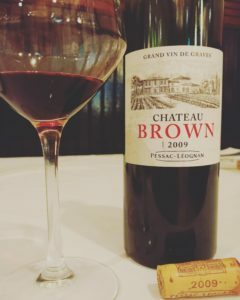 In a 2013 interview with The Drinks Business, Jean-Christophe Mau said his most treasured possession was, “the land of Château Brown” which hits home the fact that not only was there a physical devastation caused by that ferocious hail storm but also emotional trauma. Through time, I decided that I would speak my wine truth as I spoke my truth in life, not tolerating any form of character assassinations on a person, or group of people, based on their nationality, or any other exterior factor, that was influenced by the past or present gossip circulating. If I was going to be a person that truly fought the good fight in the world, I needed to start holding myself accountable in the wine world. And so I started to write stories that were based on the humanity of the people involved, mainly to remind myself so I didn’t lose hope. I thought no one would be interested, and happily I was wrong… many of us are stepping up to demand a more balanced story – to me that is where being a knowledgeable wine lover truly lies… in the constant reminder that it is impossible to know everything and you don’t need to speak someone’s language to understand them… you just need to remember that he/she is just as human as you. –2015 La Pommeraie de Brown Blanc, Pessac-Léognan AOC, Graves, Bordeaux, France: 80% Sémillon and 20% Sauvignon Blanc. 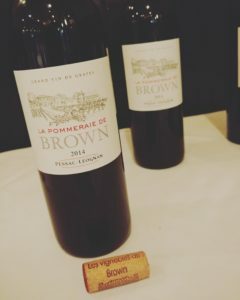 La Pommeraie de Brown Blanc is the second wine of Château Brown and comes from the same vineyard yet are grapes that are more ideal for a fruitier, lighter style of a Pessac-Léognan white wine. Notes of lemon confit and nectarine with hints of spice and hazelnut make this wine delicious now although the nice backbone of acidity indicates that it could evolve nicely with more time. 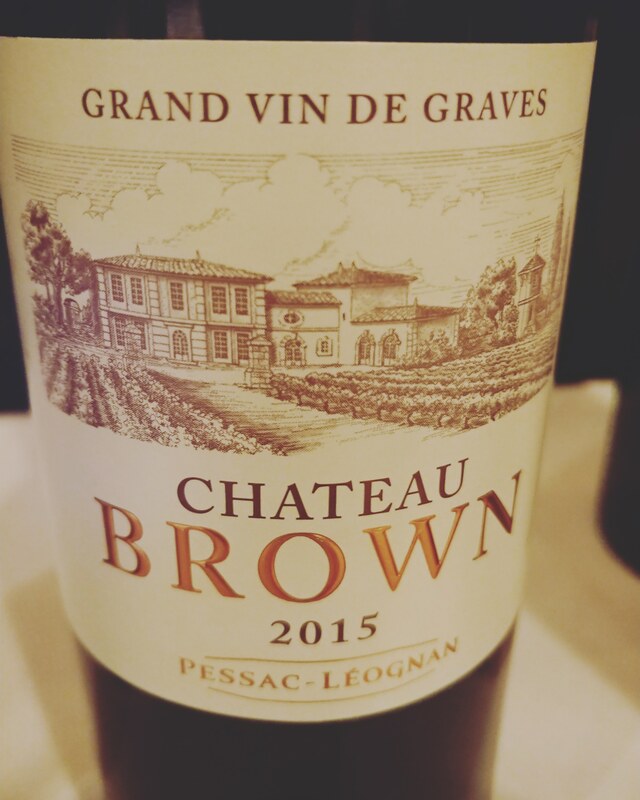 –2015 Château Brown Blanc, La Pommeraie de Brown Blanc, Pessac-Léognan AOC, Graves, Bordeaux, France: 65% Sauvignon Blanc and 35% Sémillon. I must admit that, at first, I thought I incorrectly heard the blend… the second wine has majority Sémillon and the first wine has a majority of Sauvignon Blanc. I may be incorrect, but during the time when my life mainly focused on selling Bordeaux wines in the NYC area, I was always told that, traditionally, top white Bordeaux was meant to be majority Sémillon – but Château Brown quickly sells out their top wine year after year so they are doing something right and the wine is damn good – also, Sauvignon Blanc brings that high acidity that makes wine built for longevity. Lovely notes of honeysuckle and white peach skin with hints of vanilla bean and marked acidity that gives a mouthwatering finish. –2014 La Pommeraie de Brown Rouge, Pessac-Léognan AOC, Graves, Bordeaux, France: 58% Cabernet Sauvignon and 42% Merlot. This is the second wine to Château Brown’s red and although it is the whites that are legendary in the Pessac-Léognan area, in Graves, for those who like reds with more finesse and less extraction there are some real deals in this area of Bordeaux. A bright, moderate bodied wine with notes of red cherry and allspice that had gentle tannins that gave shape without rigidity. 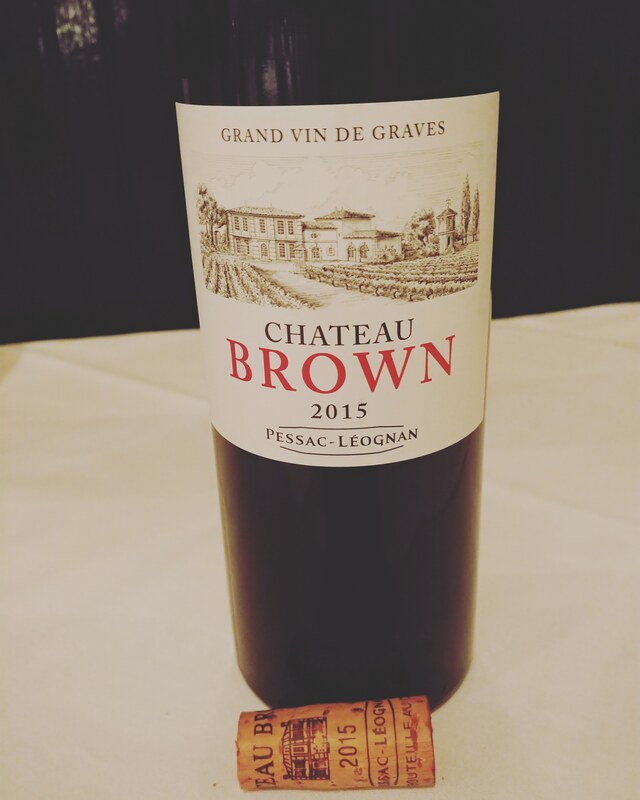 –2015 Château Brown Rouge, Pessac-Léognan AOC, Graves, Bordeaux, France: Blend of 55% Cabernet Sauvignon, 43% Merlot and 2% Petit Verdot. But the complexity level was really kicked up a notch with this first selection… intoxicating bouquet of licorice, blueberry tart and tapenade with more evident tannins that were structured like fine lace. 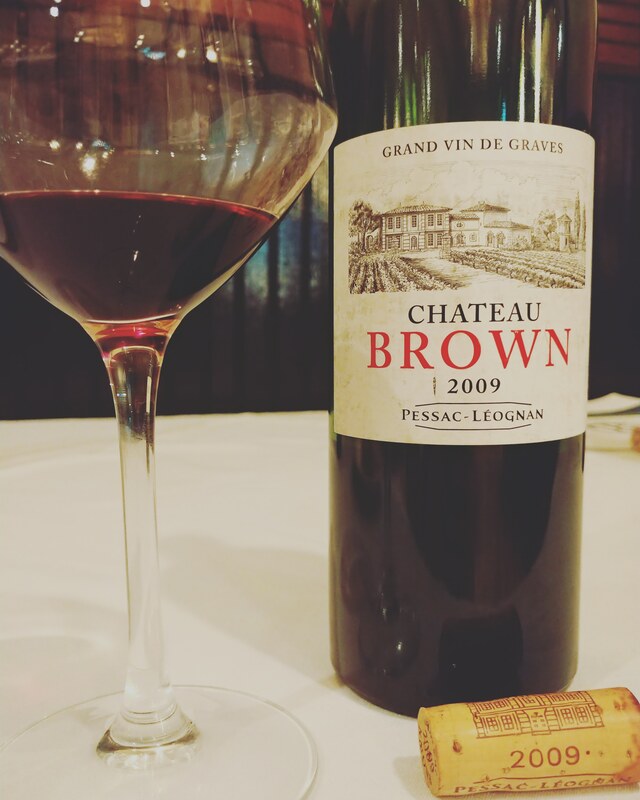 –2012 Château Brown Rouge, Pessac-Léognan AOC, Graves, Bordeaux, France: Blend of 50% Cabernet Sauvignon, 46% Merlot and 4% Petit Verdot. It may sound odd because this was not a top vintage but I was really loving this wine… perhaps that bottle just happened to be singing, or it was the pairing with the octopus that accompanied my Surf and Turf dish, or maybe, just maybe, its pure finesse and harmonious overall quality took me off-guard on a vintage that was not that popular. This wine seemed to have it all with a quiet elegance; richness of black berried fruit, complexity of smoldering earth, fine tannins that were completely integrated with bright acidity that lifted it on the long, expressive finish. –2009 Château Brown Rouge, Pessac-Léognan AOC, Graves, Bordeaux, France: 56% Merlot, 40% Cabernet Sauvignon and 4% Petit Verdot. Of course I was not shocked at all with this beauty that had velvety tannins, dusty earth, sweet tobacco leaf with a smoky finish that stayed in my head for several minutes. On July 27, 1990, Debbie Baigrie thought she was just going to have a night out with her friends in Tampa, Florida – the first time doing so since the birth of her second child… it ended up with her getting shot in the mouth when some men harassed her for money as she walked to go back to her car alone … although she went through 40 dental procedures to rebuild her gums and teeth, the mental healing was a much more arduous task. Later, she would find out that her assailant was a young man named Ian Manuel, hanging out with an older crowd, who shot her in panic… he was the only one who was caught. 3 days after the incident, he confessed to the crime and he was subsequently sentenced to life in jail… shockingly, he was only 13 years old. 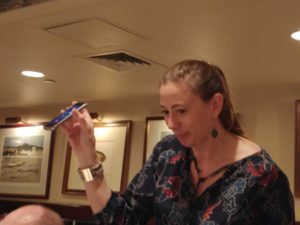 Around a month ago, I went to a seminar pairing William Fèvre Chablis wines with oysters led by William Fèvre cellar master Didier Séguier and author & oyster guru Rowan Jacobsen at Seamore’s in NYC. 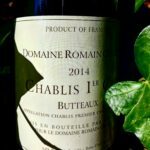 At one point, Rowan said in regards to an oyster, “always catching it in a little snapshot in time” when the first oyster, paired with an every day drinking Chablis, had a lot more richness than expected. Rowan pointed out that the oyster had a purple edge and said that it was probably an indication that it was feeding like crazy during the spring, and because the waters were warming up recently, it started to convert all that it was feeding on into fat, which sometimes happens. He then said that if he knew that it would be at this stage, he would have paired it with a richer wine in the lineup, such as one of the Grand Cru. 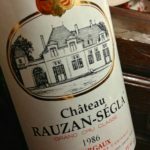 Like so many other wine nerds, I have of course been obsessed with Burgundy for most of my wine loving existence, over a couple of decades now, and despite loving oysters and enthusiastically eating them by the dozens when given the opportunity, I really didn’t think about them being like Burgundy wines. Since oysters are filter feeders, they are one of the ideal foods to express terroir, or in this case “merrior” as Rowan said. 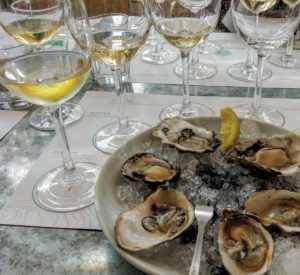 Also, there are 5 different species of oysters and they are affected by human influence, such as with wine and winemakers, as there are a few different ways to handle them; so pairing a different type of oyster with each wine that each had a distinctive expression of place and style, especially with the Premier Cru and Grand Cru single vineyard wines, made perfect sense. Chablis and oysters are generally a classic pairing, as you can imagine, but this seminar showed that one could take this pairing to a deeper level. It was a great experience to taste the 2009 and 2016 Chablis Grand Cru AOC Bougros ‘Côte Bouguerots’ in the same lineup and to experience the very different oysters that accompanied them. 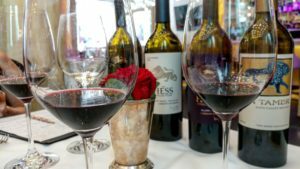 The 2009 was paired with an extreme oyster that usually wouldn’t be paired with any wine because it would overwhelm it, but in this case, the big, rich and multi-faceted 2009 had evolved to a place where it could take on such an oyster, unlike the 2016 version… not only was 2009 older, but it was given more opportunities to thrive in a contrasting vintage. After his first year in jail, a 14 year old Ian Manuel ended up calling his victim Debbie Baigrie after seeing her phone number on his paperwork. He apologized and asked if he could write to her… she said yes and so their correspondence started and continued during his many years in jail – much of his sentence carried out in solitary confinement. Debbie was taken aback by his ability to express himself through language and the deep thoughts he conveyed through his written words. She encouraged him to educate himself as much as he could while in jail, and since his mother passed away while he was incarcerated, Debbie ended up becoming his adopted mother. In 2006, after spending 16 years in jail, Ian was given the chance to challenge his sentence 6 years after a Supreme Court decision prohibited life sentences for juveniles charged with anything less than murder, with Debbie by his side. He was released that day and since then Debbie has been his biggest supporter to help him to adjust to society… to continue his education… to live up to his potential. I first heard about Ian and Debbie’s story last year and it has stayed with me ever since. It made me think that if she had decided to keep her opinions about him frozen in that one snapshot in time, his life would have turned out differently and many of us wouldn’t have had the chance to be inspired by their story… if things had worked out differently, he may have been rotting away in solitary confinement, going slowly mad with no real human interaction. Honestly, I don’t know if I would have the strength that Debbie had to first start the correspondence. I hope I would… but as she said in an interview, she makes no bones about him being responsible for what he did, but he was only 13 years old. What are the snapshots in time of ourselves we would like to forget and those that we would like to be remembered for? What are the snapshots of others that we hold on to? What world does our mind see? The one of the past? The one of the future? Maybe we are missing more than we know, right in front of us. We don’t see the potential. We don’t see the possibilities. 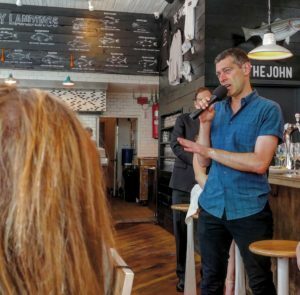 I was extremely impressed with the knowledge of oyster guru Rowan Jacobsen, but I was most impressed to see him acknowledge something that surprised him in the moment. I know how one can have blinders when having spent so much time preparing for a seminar (that was being officially recorded for a learning tool no less) and it takes so much strength to stay in the moment itself, many times fighting our nerves and/or insecurities. Not only was he aware that things did not go according to plan, but he admitted it as well, becoming a learning moment for all of us in the room. 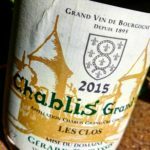 The great Chablis wines, such as the Grand Cru, can be very deceptive in their youth… from a classic, cooler year they can be tight and hard with fierce acidity – none of the beautiful complex notes ready to reveal themselves. It is not always fair to judge their quality in that fledgling stage. It was like that moment when Debbie read Ian’s first letter… she was willing to look past a moment that actually caused her a tremendous amount of mental and physical pain… and decided she could take a tragic moment and make it an opportunity to do a lot more good in her life. When we are looking for our purpose, sometimes it comes in the most unlikely places but we have to be awake in that moment to allow what we thought we knew to pass so we can open our eyes to the beauty of the world in front of us. I participated in two Chablis tastings on May 22nd, 2018: the first was the above mentioned Chablis and Oyster pairing and the second was a Twitter Chat/Tasting later that night. All Chablis is 100% Chardonnay which is interesting to note as many people who think they don’t like Chardonnay like Chablis; it is its own wine connected to a specific place with its ancient Kimmeridgean soil that is estimated to be around 150 million years old. Also, the Chablis district’s close proximity to Champagne provides a cooler climate than the rest of Burgundy and their wines are known for their high acidity and expression of a chalky minerality that can also be found in Champagne. William Fèvre cellar master Didier Séguier said that they never use new oak for their Chablis wines because he noted that when you use new oak, you make Chardonnay; when you don’t, you make Chablis; expression of place, terroir, is their main goal. 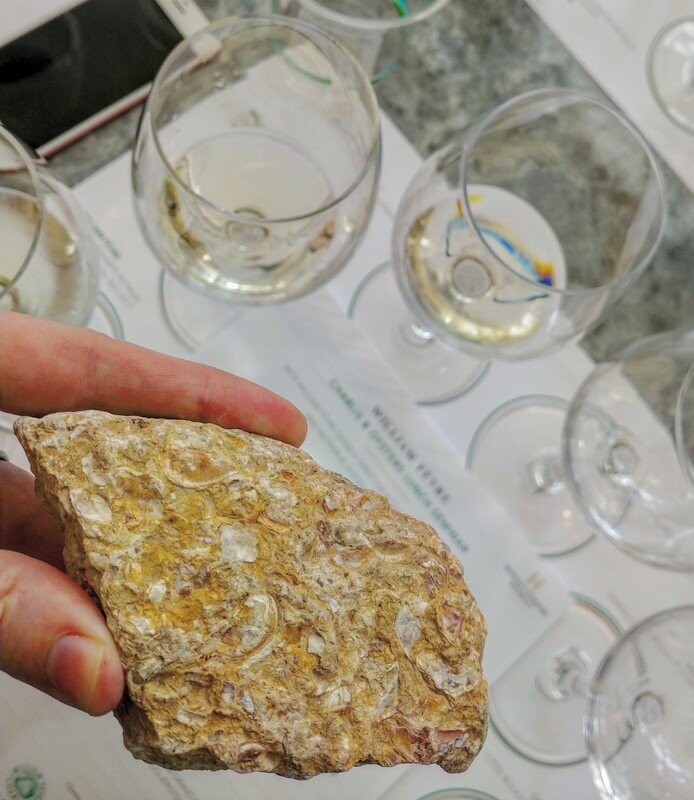 The new Limited Edition Sea Label will be released on August 5th, National Oyster Day, and the label depicts the oyster fossil soil (Kimmeridgian) which is credited for the mineral notes observed in Chablis wines. 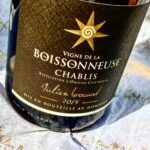 2017 was a tough vintage as Chablis suffered from frost 15 nights in a row, but although it was a low yield they were able to produce classic wines with high acidity and intense energy. 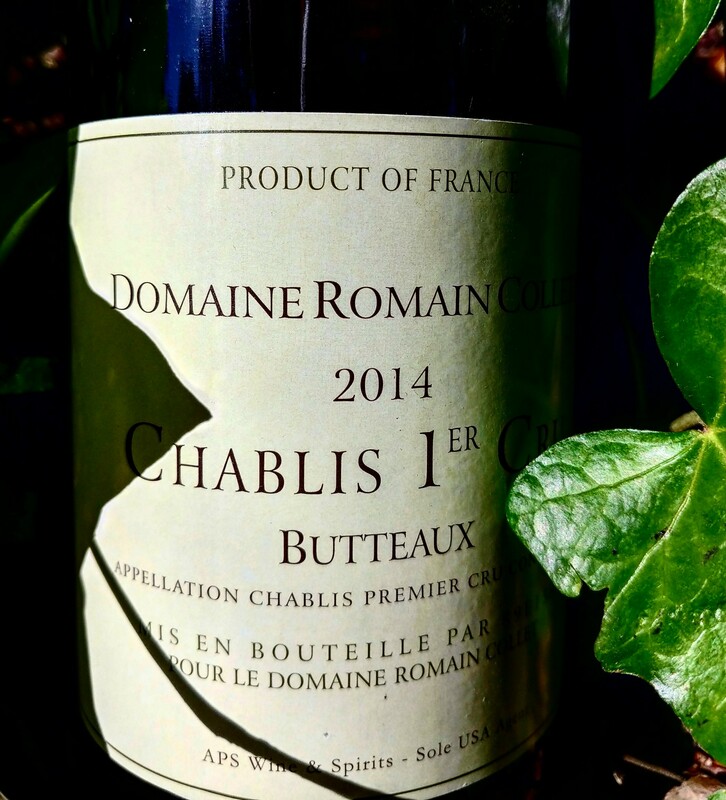 –2016 William Fèvre, Chablis Premier Cru AOC Montmains, Domaine: This Montmains 1er Cru vineyard is known for its upfront minerality and so Rowan said that he was thrilled to pair it with an East Coast, Eastern, oyster from Duxbury, Massachusetts (an area that is known for oysters) because of its intense saline minerality. He warned against adding too much lemon or any other condiment because it could cover the saline minerality or other complexities of high quality oysters. 2016 was noted as having the ripeness of 2015 (a warm year) and acidity of 2014 (a cooler vintage) and it will be remembered as suffering from a succession of climatic incidents that would make it one of the most trying in modern history; in 2016, William Fèvre’s yield was 1/3 of their typical average. –2016 William Fèvre, Chablis Premier Cru AOC Montée de Tonnerre, Domaine: White peach skin with crumbled chalk that had a rich, creamy body, paired with an oyster called Sea Cow that is considered the “foie gras of the ocean”. Sea Cow is a Pacific oyster that is placed in tumble bags because they are located in a watershed in Washington State that encourages fast growth – they use the tumble bags to slow down the growth, so their shells don’t get too thin, and the oysters freak out because they think a predator is throwing them around so they open and shut constantly – lots of exercise that builds a muscle that gives them firmness and sweetness – tumbling is all the rage now on the West Coast. Also a fun side note: Generally East Coast oysters are 2-3 years old and West Coast oysters are around 18 months old. 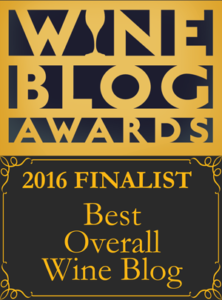 -2016 William Fèvre, Chablis Grand Cru AOC Bougros, ‘Côte Bouguerots’, Domaine: An incredible wine that had fierce, steely acidity and intense richness of fruit that was laced with saline minerality with a long flavorful finish; matched with the equally intense Eastern oyster called Bluepoint from Mystic, Connecticut, that had intriguing metallic notes like iron and an overall wild quality. This wine is a blend of separate vinifications of different plots in the same Grand Cru Bougros; one on a 45 degree slope that produces grapes with high concentration of ripeness and the other is on a less steep slope producing grapes with intense freshness. -2016 William Fèvre, Chablis Grand Cru AOC Les Clos, Domaine: An exotically spiced wine that had juicy nectarine fruit and perfumed flowers with a mineral edge that was most noted on the finish; broad, bright and bada$$. This is the same oyster as paired with the first wine, Hama Hama, from Washington State’s Hood Canal but the human influence is different as it is placed in tumble bags unlike the 1st Hama Hama. These oysters are called Blue Pools and it had the same herbaceous quality as the first yet it was plumper with a sweet finish. 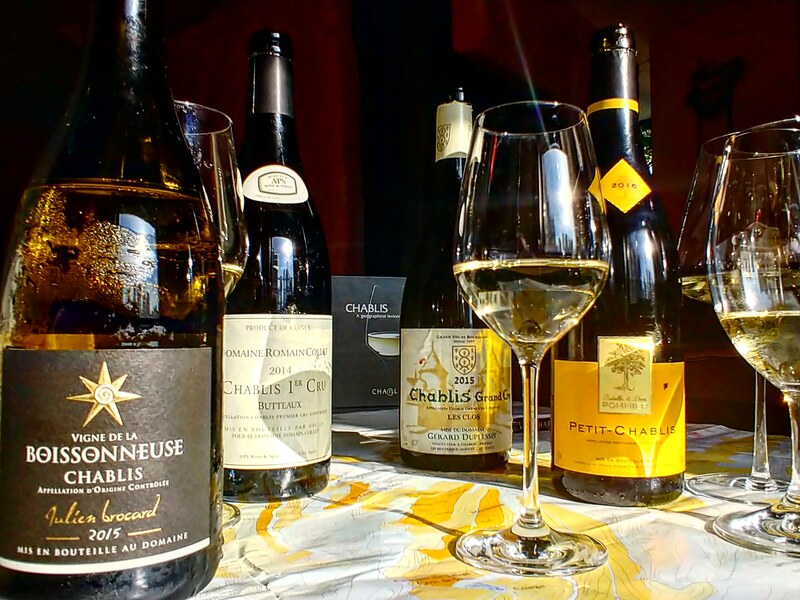 Les Clos is the largest and most famous Grand Cru; its fame is based on being one of Chablis’ first named vineyards. –2009 William Fèvre, Chablis Grand Cru AOC Bougros, ‘Côte Bouguerots’, Domaine: Yellow pear with hints of mango that had pressed flowers and sea shells intertwined within the generous fruit… lots of delicious fleshy fruit still with enticing smoke and sensual texture on the finish. This wine is singing right now. Rowan decided to pair this decadent wine with an oyster with a fierce salinity that normally doesn’t pair well with most wines: Wellfleet from Cape Cod in Massachusetts that comes from a section that has no fresh water areas and so this oyster was influenced by the ocean. 2009 was a warm vintage like 2005 – Didier said they harvested early to keep freshness and acidity. 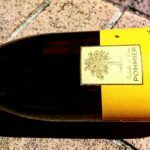 -2016 Isabelle et Denis Pommier, Petit Chablis AOC: It had pristine fruit with juicy peach and nectarine with a refined wet stone finish… lovely. 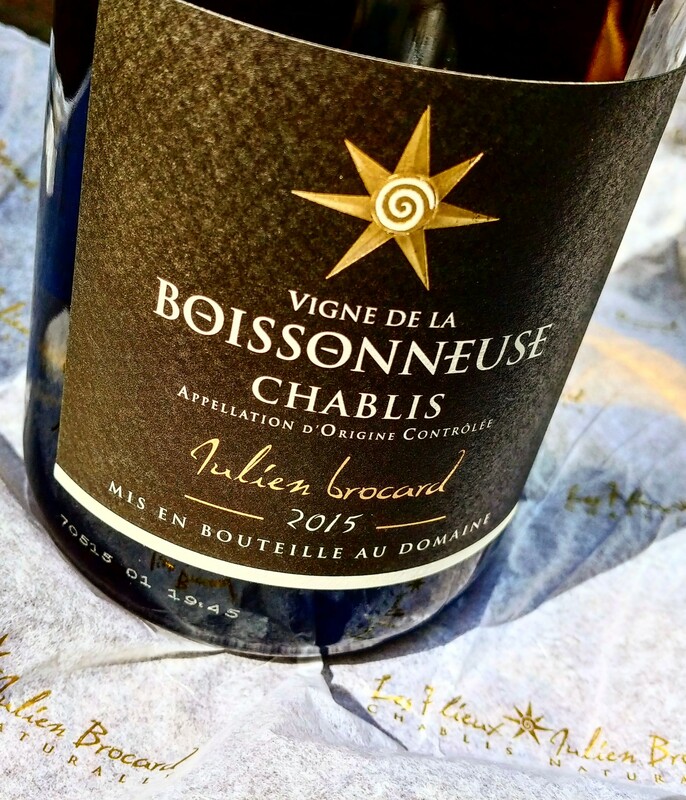 –2015 Julien Brocard, ‘Vigne De La Boissonneuse’, Chablis AOC: A single vineyard of biodynamically treated vines; it immediately impressed with a thick waxy top and a fine piece of paper that covered the bottle. A wine crafted with love showing volcanic smoky notes with rich lemon curd on the palate. -2014 Romain Collet, Chablis Premier Cru AOC Butteaux: An intense limestone backbone that slapped me in my face with ‘get your attention’ acidity – I don’t mind this kind of slap in the face at all! Orange zest. seashell and briny goodness with a long, linear, fierce finish – OH YEAH BABY HURT ME! 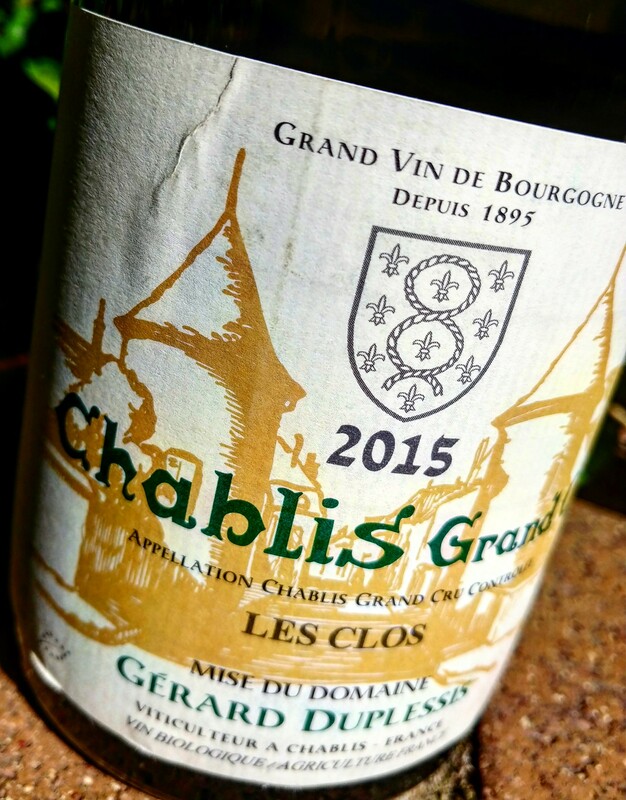 -2015 Domaine Gerard Duplessis, Chablis Grand Cru AOC Les Clos: Complex notes of chalky, crumbly rocks with lime blossom and white peach with a rich and expressive overall quality on the extraordinarily long finish. OH MY, THIS WAS DAMN GOOD! Sometimes I just stop in the middle of New York City, take a step back and take it all in… I look all around… the buildings, the cars, the people, all types of technology, all types of people, living a life that is built on the foundation of human curiosity. Relatively, we have not been on this planet that long but we have created, invented and constructed things that are beyond comprehension when considering the environment at the time of the beginning of our species. And that curiosity is far from satisfied as we go beyond this planet as well or explore the depths of the oceans… some of us don’t even get swayed by others telling us that a particular path to knowledge and experience is a dead end… some of us cannot simply take the word of others… we need to experience it for ourselves. During my trip to Sicily back in May, I had the good fortune to end up at the Baglio Sorìa Estate. It was not so much good fortune because it is an incredible resort with a fine restaurant, or panoramic views, or Valli Trapanesi DOP olive trees on their property, or the idea that they became completely organic even before the organic certification existed in Italy, but I felt I was fortunate because I learned about the wines from the dead land. 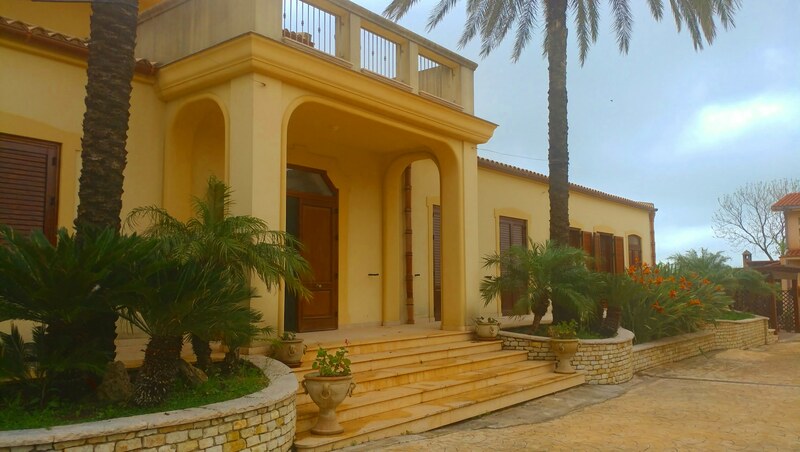 Baglio Sorìa Estate is part of the Di Gaetano family’s estate group called Firriato and it is their first estate which started their passion for vineyards and winemaking; Baglio Sorìa being the estate closest to the Mediterranean Sea in Western Sicily. 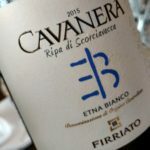 Firriato has a total of 6 estates with 4 being on the West side of the island and 1 being in the East, Cavanera Etnea on the slope of the volcano Etna, and the last estate is on the tiny island of Favignana off the Western coast of Sicily – or affectionately called The Dead Land. Firriato’s Calamoni estate on Favignana has many notable aspects such as ancient fossils and calcarenite limestone formed over millions of years but none more interesting than the fact that it has been considered by many agronomists, people who study the science and technology of producing and using plants, as an area not suitable to grow much of anything, furthermore, one agronomist stated that a wine producer could place all the money and resources to accomplish the ideal viticultural practices on the Favignana island and that producer would still never be guaranteed of any results. Federico Lombardo di Monte Iato, COO and family member of the Firriato estate group, was telling us about their Favignana project, started in 2007, as we tasted their white wine Favinia ‘La Muciara’ from this unique place; also they have a red wine and a sweet wine made from dried grapes. As Federico talked about the severely rocky ground, the fierce winds, the intense sun and most of all the toxic soil due to the chlorine which is caused by excess salt (sodium chloride) I could not help but jump in and ask, “Why are you planting vineyards on Favignana if growing vines is so difficult there?” and his answer was simply that they wanted to know what was possible… despite not finding proof of any plant being cultivated on the island of Faviganan, their wonderful human curiosity got the best of them. 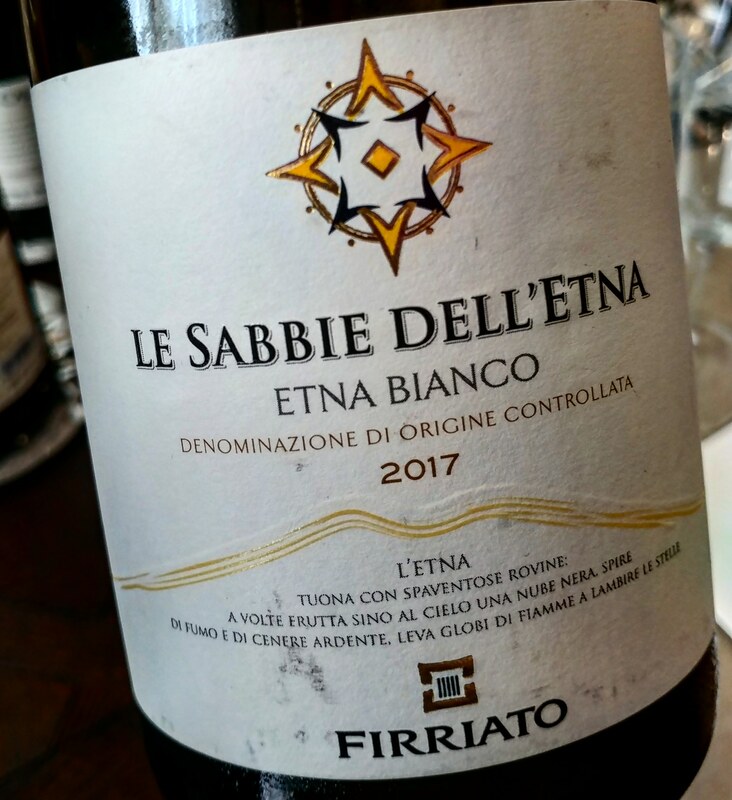 One of Firriato’s favorite grape varieties to grow on the Favignana island is the classic aromatic Sicilian white Zibibbo (Muscat of Alexandria) because Federico said that it develops aromas that they had never experienced; further research they have conducted point to Zibibbo producing significantly more terpenes (terpenes are organic compounds produced by a variety of plants that can result in an array of aromatics in a finished wine) when grown on Favignana compared to when grown anywhere on the island of Sicily; also Federico said that the wines seem to have great ageability. Despite at times seeming like Firriato was getting way over their heads when taking on the Favignana island project, once they realized the unique beauty within this “dead land” they knew they had to keep placing their energies into it…. 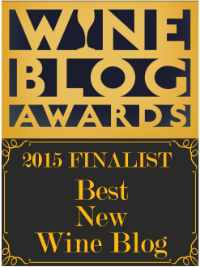 and they hope that other wine producers will join them on Favignana. Curiosity may kill the cat but it helps keep the human spirit alive and open… once we allow our knowledge to be limited by what we have been told rather than what we have directly experienced, we become part of a narrow-minded world that keeps everything, and everyone, in a superficial compartment. We can never really experience the potential of the world we live in, or the people who surround us, if we are always coming to the table thinking we know what to expect considering that each of us live in our own bubble.… How many dead lands are out there, I wonder? How many people in our community do we consider to be a dead end when it comes to investing our time and money? How many benefactors are curious enough to want to invest in these people and places to see if there is something deeper that goes beyond the numbers reported and what the outside world tells us what is logical to consider? 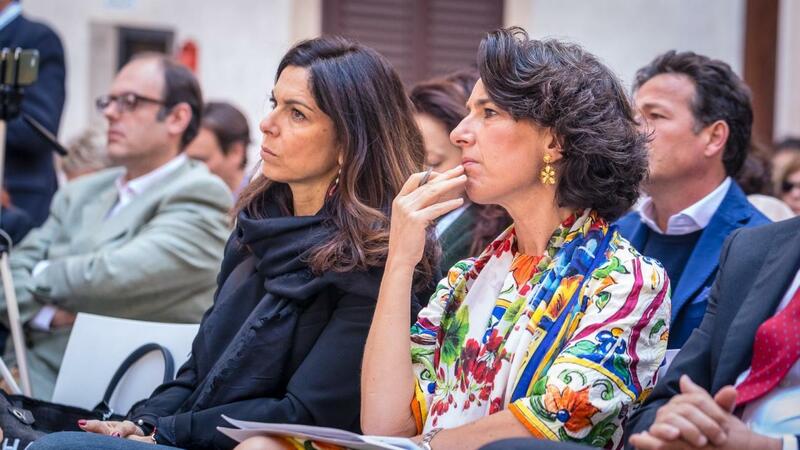 The Favignana project is a lesson that actions don’t always need to make complete sense because we do not know all the precious gems out there in the world… and without curiosity we never will. 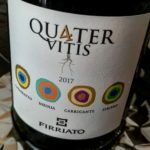 We tasted a lineup of Firriato wines; again, they have 6 estates with 5 located in Western Sicily, including the island of Favignana, and 1 in Eastern Sicily, Cavanera Etnea, on a slope of the Etna volcano. 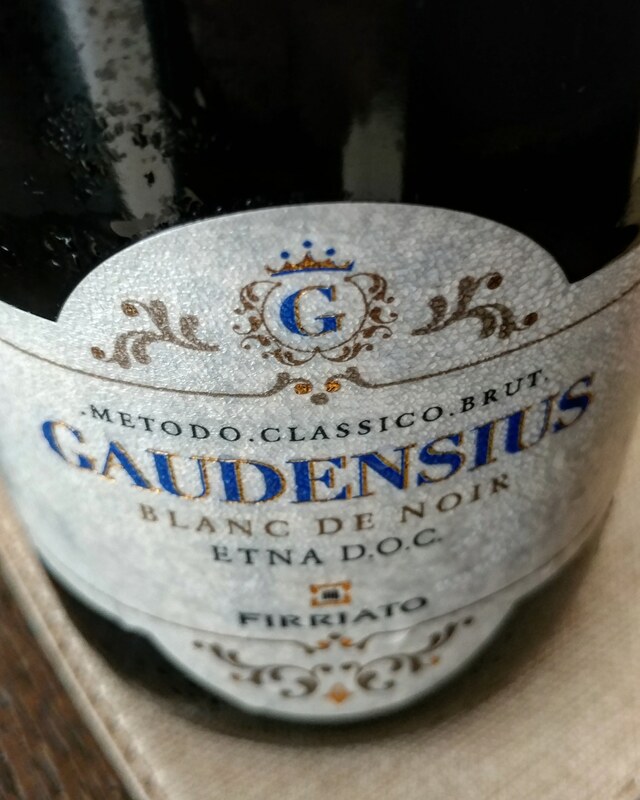 –NV Gaudensius, Blanc de Noir, Metodo Classico Brut Etna DOC: 100% Nerello Marcalese. The Metodo Classio Brut Etna DOC only allows 100% Nerello Marcalese. From the Cavanera Etnea Estate on the Northeastern slope of Mt. Etna 650 meters (2100 feet) above sea level. 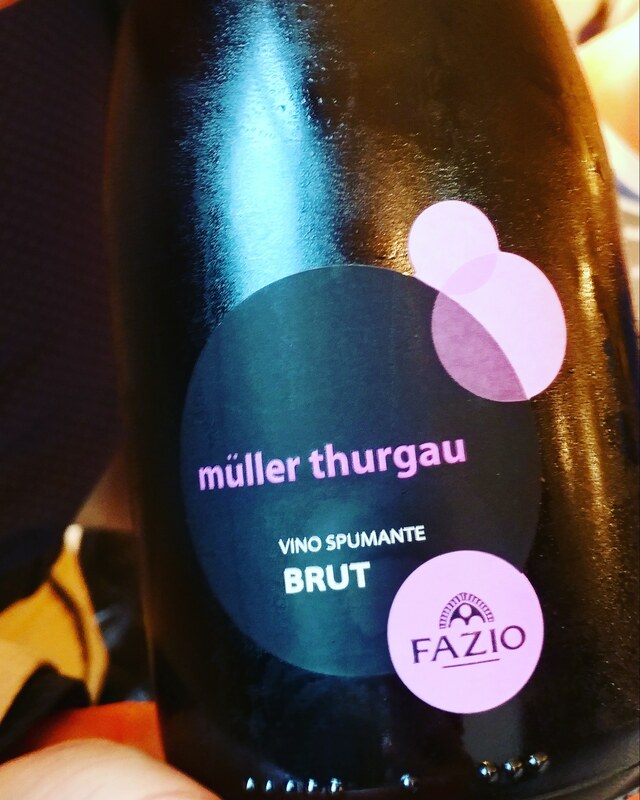 This is a traditional method sparkling wine that had crunchy red fruit, smoke and orange peel with fine, creamy bubbles. 1st year production was in 2009. 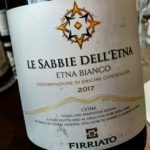 -2017 Le Sabbie dell’Etna, Etna Bianco DOC: White blend of Carricante and Catarratto, from the Cavanera Etnea Estate on the Northeastern slope of Mt. Etna 720 meters (2400 feet) above sea level. White flowers, peach skin, almonds and a saline finish that had marked acidity and a long length of aromatics. –2016 Favinia, ‘La Muciara’, Terre Siciliane IGT: White blend of majority Zibibbo with Grillo and Catarratto. 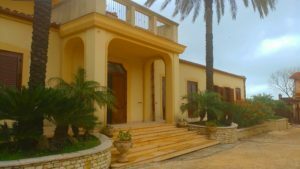 From the Island of Favignana – Calamoni di Favignana Estate. Seashell, lime blossom, hint of perfume, elderberries with hint of ginger that was rich in fruit yet vibrant in acidity. 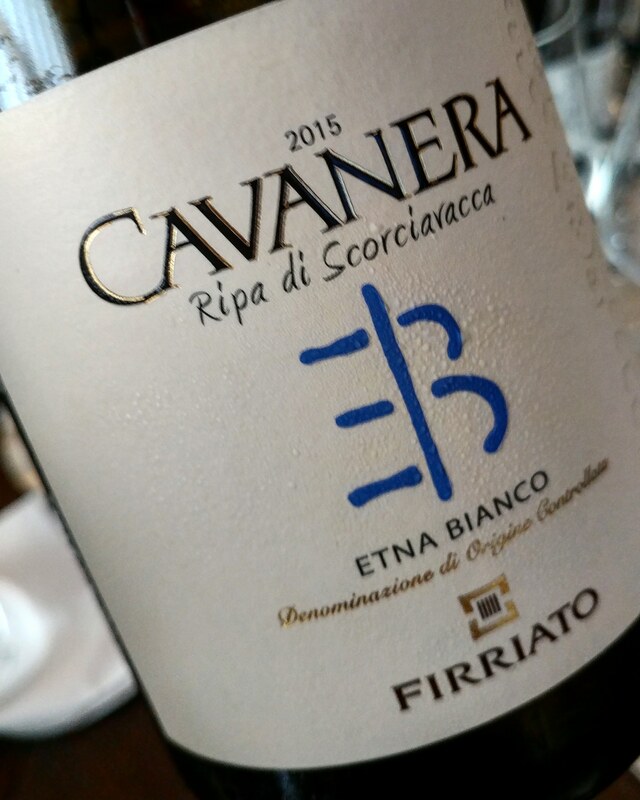 -2017 Cavanera, ‘Ripa di Scorciavacca’, Etna Bianco DOC: White blend of Carricante and Catarratto from Cru of Etna. From the Cavanera Etnea Estate on the Northeastern slope of Mt. Etna 750 to 850 meters (2500 to 2800 feet) above sea level. Honeysuckle, flinty minerality with linear, energetic body that had pretty lemon confit notes on the finish. –2017 Qu4ter Vitis, Sicilia IGT: White blend of Catarratto, Inzolia, Zibibbo, and Carricante from the Etna volcano – the 4 in the middle of “quarter” is a hint to the fact that there are 4 varieties in this blend. This wine is called “Sicily in a glass”. 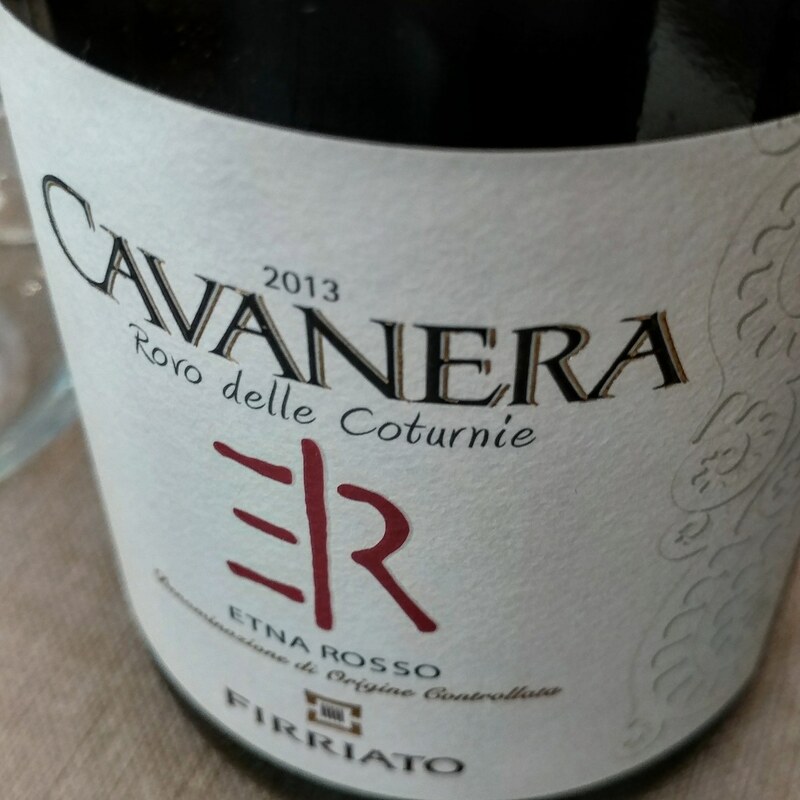 A blend of grapes from Pianoro Cuddìa Estate in the Western Trapani countryside and from their Etna estate, Cavanera Etnea. 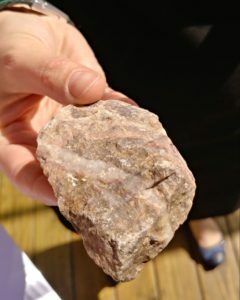 Pressed flowers, citrus pith, green almond and stony rocks that had a broad body. -2017 Jasmin, Terre Siciliane IGT: 100% Zibibbo (Muscat of Alexandria). Dry aromatic white wine from Borgo Guarini Estate. 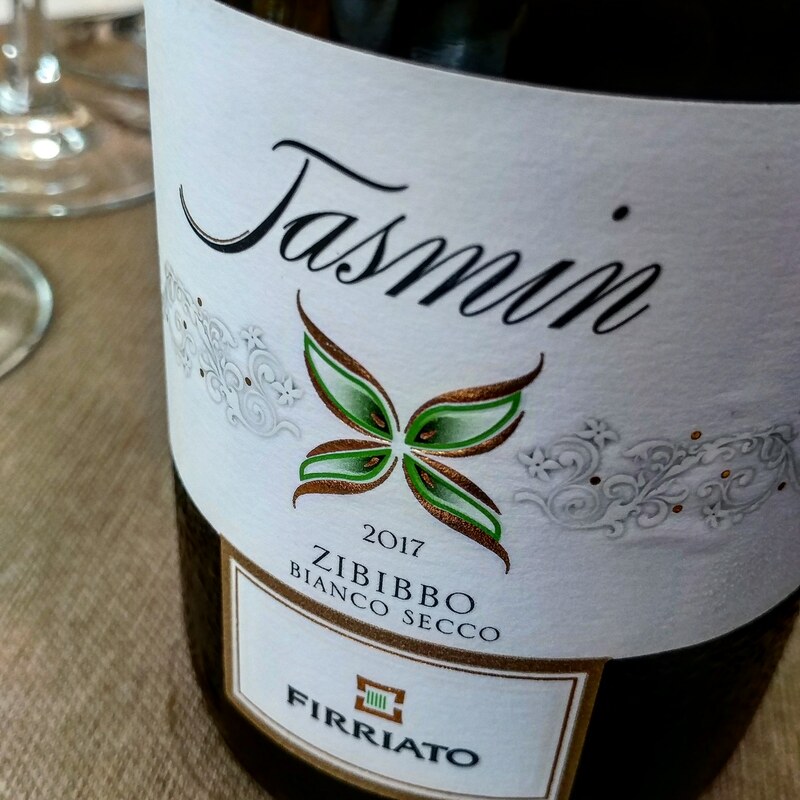 Jasmine flowers, rainforest and ripe peaches make this a delicious wine that is beautifully kissed by the sun of the Italian Trapani countryside. 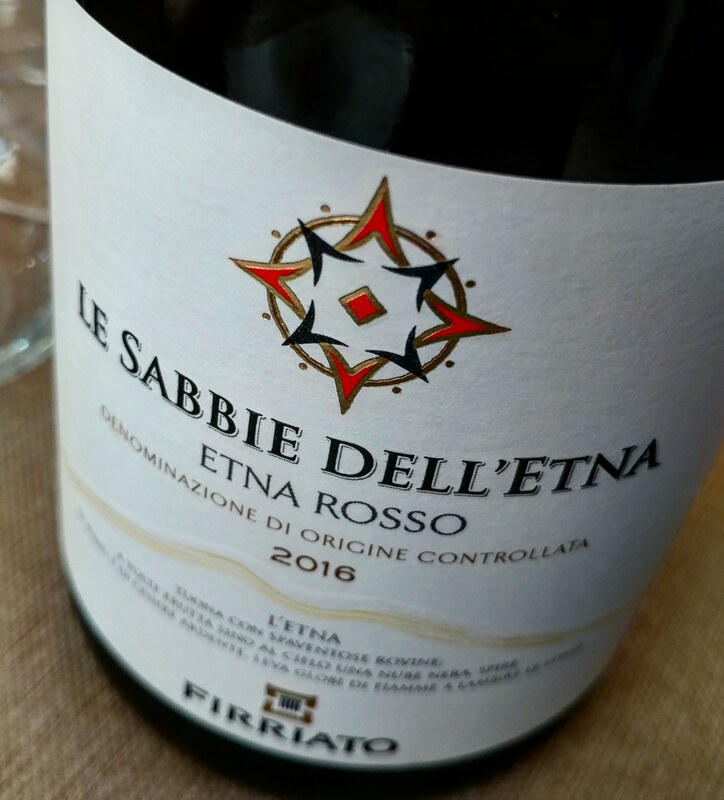 -2016 Le Sabbie dell’Etna, Etna Rosso DOC: Red blend of Nerello Mascalese and Nerello Cappuccio. From the Cavanera Etnea Estate on the Northeastern slope of Mt. Etna 700 (2300 feet) above sea level. Fantastic old world charm with bacon bits, dusty earth with new world sophistication of manicured tannins and fresh black fruit. –2013 Santagostino, ‘Baglio Soria’, Sicilia IGT: Red blend of Nero d’Avola and Syrah from the Baglio Sorìa Estate. 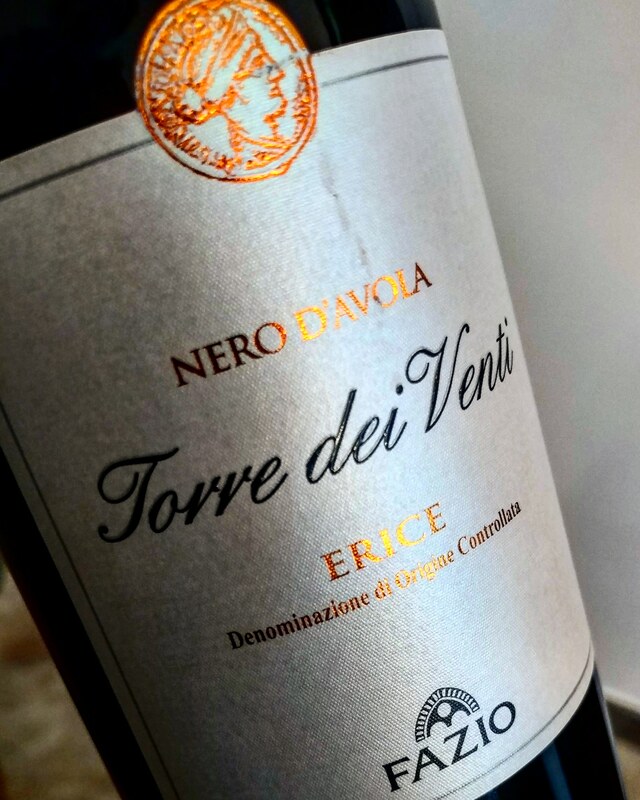 This is a fantastic, super-star wine that shows the power of when the king of Sicilian grape varieties, Nero d’Avola, is blended with the international grape variety that does the best in Sicily, Syrah. Enticing aromatics of a forest floor right after the rain, sweet tobacco left with lifted rhubarb notes and cloves on the expressive finish all wrapped together by muscular tannins. -2013 Cavanera, ‘Rovo delle Coturnie’, Etna Rosso DOC: Red blend of Nerello Mascalese and Nerello Cappuccio from Cru of Etna. From the Cavanera Etnea Estate on the Northeastern slope of Mt. Etna 750 (2500) above sea level. Wafting notes of rose oil draws you in with hints of wet stones and finely laced tannins that had a bright finish – elegant. 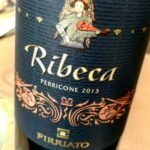 –2013 Ribeca, Perricone, Sicilia DOC: 100% Perricone from the Pianoro Cuddìa Estate. 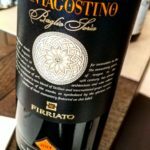 Perricone used to only be a blending component in Sicilian reds but some producers are taking it more seriously, such as this mono-varietal bottling. This wine has Mediterranean generosity with ripe black and red fruit with layers of complex savory notes of dried herbs and fresh bay leaf. It is lush yet had plenty of structure to give it shape and drive. 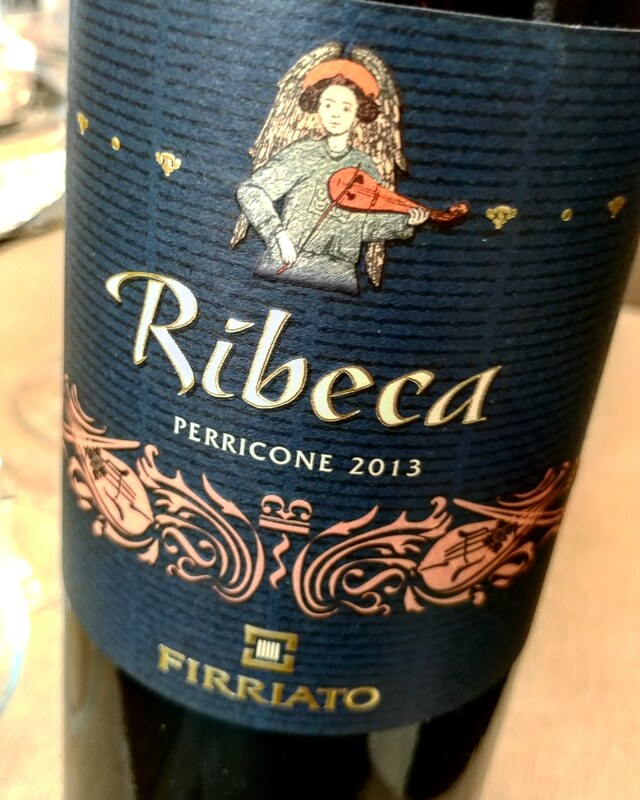 Firriato has been researching Perricone since 1985 and they have isolated their own biotype (clone). 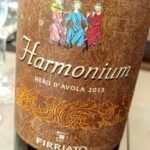 –2013 Harmonium, Nero d’Avola, Sicilia DOC: 100% Nero d’Avola from the Borgo Guarini Estate. 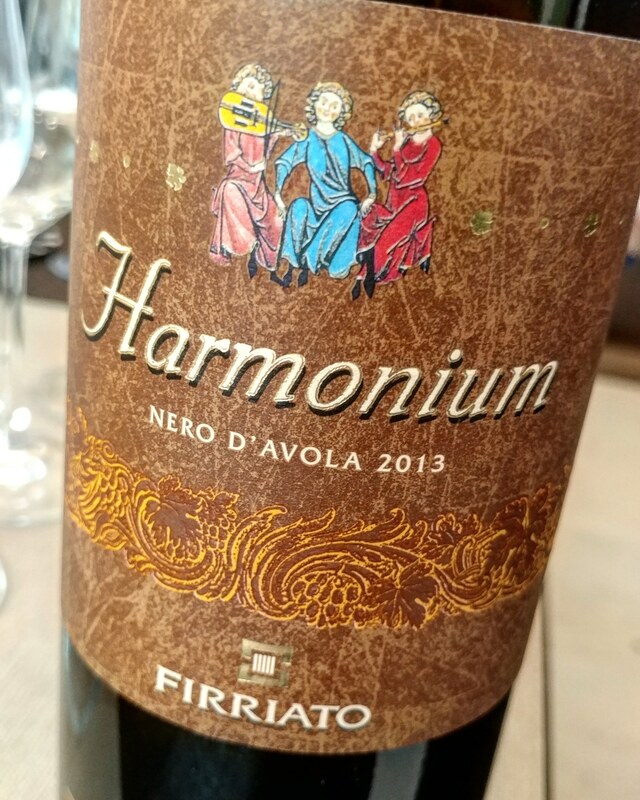 This is a blend of 3 different single estates and 2 different biotypes (clones) of Nero d’Avola to create a wine with more consistency year in and year out. This wine had a lovely harmony with mulberry fruit, baking spices and cocoa powder with sculpted tannins that was balanced by a fleshy body. 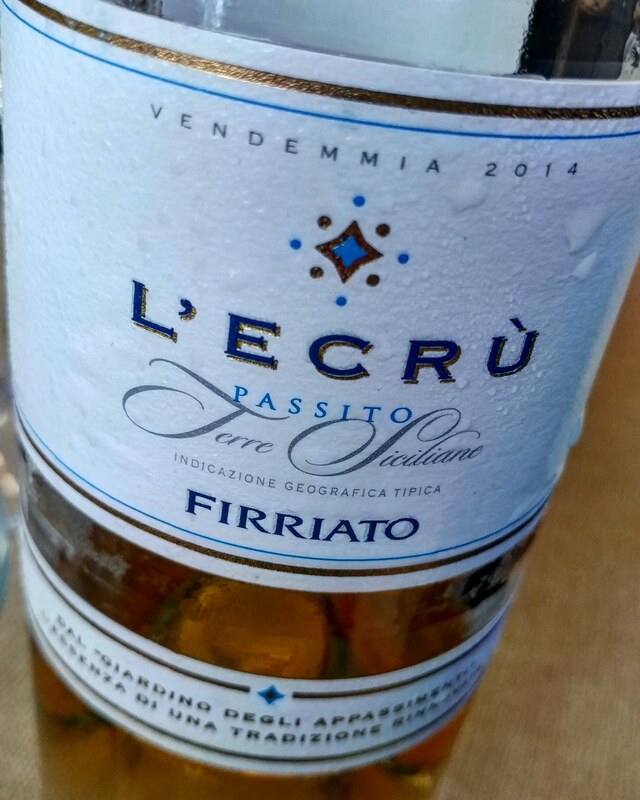 –2014 L’Ecrù, Passito Naturale, Terre Siciliane IGT: 100% Zibibbo sweet wine from Borgo Guarini Estate made by harvesting a mixture of fresh and late harvested grapes that are dried on the vine. Rich sultana with honey and fresh sage with invigorating orange peel on the finish that begs for another sip. “It is a visit of intention” said Nicole Carter, Director of Winemaking at Hess Family Wine Estates. She was talking about their mother ship winery founded by the living legend Donald Hess that was perched on Mount Veeder in Napa Valley – with very few other wineries that had the facilities to accept guests on the mountain, Nicole said if you visited their winery it really had to be a visit of intention. The idea of living with intention is a powerful one that is actually simple for most of us. It is an exercise of the mind that those who practice mediation, yoga or Buddhism may know very well or perhaps you may even know it without being involved in any of the aforementioned practices. Our intention can be as simple as focusing on our breath, trying to be more empathetic or firm with our dealings with people, or forcing ourselves to take on the challenges we avoid. It is a decision that we can make each day to notice something that we would like to either work on or simply just be aware of. Instead of sleep walking through life, we actively engage and take responsibility. It can be transformational to get us out of ruts where we stop caring, stop feeling, or stop wanting to participate. Swiss-born Donald Hess is a very successful business man who has been involved in making beer, mineral water, and wine. He is best known here in the US for having one of the most impressive contemporary art collections in the world and being one of the largest land owners of vineyards in Napa Valley that was started with his first purchases in 1978 and almost 1000 acres (400 hectares) accumulated today; he has furthered that legacy by producing some of the top mountain Cabernet Sauvignon with an interesting spin of adding a significant amount of Malbec to certain blends. 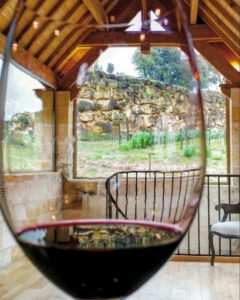 Donald has a deep understanding of the Malbec grape as he has 2 estates in Argentina specializing in Malbec, and one of the wineries, Colomé, has one of the highest vineyards in the world – and so high altitude vineyards are in his blood. When a person gains a certain amount of money and resources, there is a greater responsibility to live up to stronger intentions than the average person that not only impact communities but also the world. Since 1978, Donald has been a leader in long-term sustainability with the attitude, “nurture the land and return what you take” at a time when the word sustainability did not have the value that it has today; he has even had a talent in finding usable water in areas of Argentina where it was unheard of; his contemporary art collection – a small portion is housed in a three story museum that was built on the property of their Mount Veeder Estate – has helped to support many artists as he buys from those he has developed a relationship with and continues to purchase their works throughout the span of their careers while refusing to buy their works after they have passed away; his intention is to support artists long term while they are living and not to give in to trends or buy based on investment purposes. Donald Hess did not want to just make mountain wines in Napa, he wanted to show others that it was possible to make excellent wines out of mountain fruit that at one time no one wanted anything to do with… and he has never given up on always striving for a higher standard with constantly examining if they are making the best wines they can and the answer is always no, and so, the intention is always renewed. Nowadays you cannot throw a stick in New York City without someone trying to talk about mountain wines, as they have only recently become trendy, actually sometimes over-exaggerating the idea of what a mountain constitutes depending on the producer… but Donald always knew and he had the intention that he needed to show the world that what they thought was impossible was possible. Donald has now officially handed over his winery to his daughter Sabrina and son-in-law Tim Persson as it is time for him to sit back in his home in Switzerland and have the warmth of memories of a life well lived – for shaping the world into a better place – wash over him with a deep contentment. When I think about when I am old and tired and all I have is the energy to examine my past intentions in life, I wonder what I will take pride in… to live with honor, to live with passion, to live a life where I felt I made one person’s life better each day I lived… that is what takes The Hess Collection to the next level… the intention… some thought it could never be done, and some would question even after success if Hess had peaked, and each time the Hess family comes back with the ferocity of a lion, the symbol of their Hess family for many generations, with a more committed intention than before to continue to be a beacon of inspiration … our life only lacks meaning if we do not stay true to our intention. 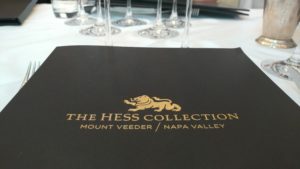 Although Hess is fortunate enough to have many vineyards on Mount Veeder in Napa Valley that can express a vibrancy and complex aromatic profile that only mountain fruit can produce, they have, over the years, realized that their management of tannins needed to be drastically improved, and so through many innovative techniques such as shade cloth in their vineyard that helps with phenolic ripeness, they have drastically improved the mouthfeel of their wines. Their intention for improvement still lives on and I am excited to see what the future holds. –2016 Hess Collection, Chardonnay, Napa Valley: 100% Chardonnay with 9 different clones (biotypes) used such as the unique Musqué clone. 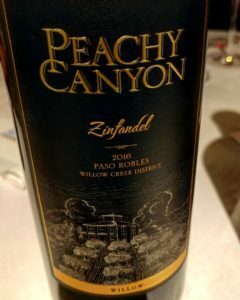 This wine leapt from the glass with pretty honeysuckle and pear notes with rich peach and spice on the palate and had energetic drive with a hint of seashell on the finish. 2016 was a balanced vintage that saw ideal conditions. 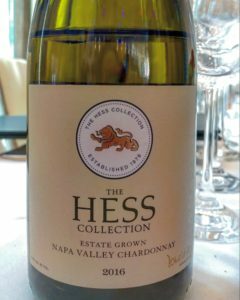 This Chardonnay comes from one of their Napa estates that is around 175 acres (70 hectares) in the southern portion of Napa; surprisingly enough this Napa property is south of Carneros and really only Chardonnay is planted there because of its proclivity for producing elegant Chardonnay. One of the 9 clones (biotypes) they use is Musqué which is not that commonly planted in Napa – it is an aromatic clone that has an overall delicate quality to it and does not take well to oak or MLF and so the wine is lightly oaked and only partial MLF – 70% of the wine is fermented in stainless steel, 30% in oak (only 9% in new French oak) and that 30% is the only wine that goes through MLF. It is aged 9 months in neutral barrels. 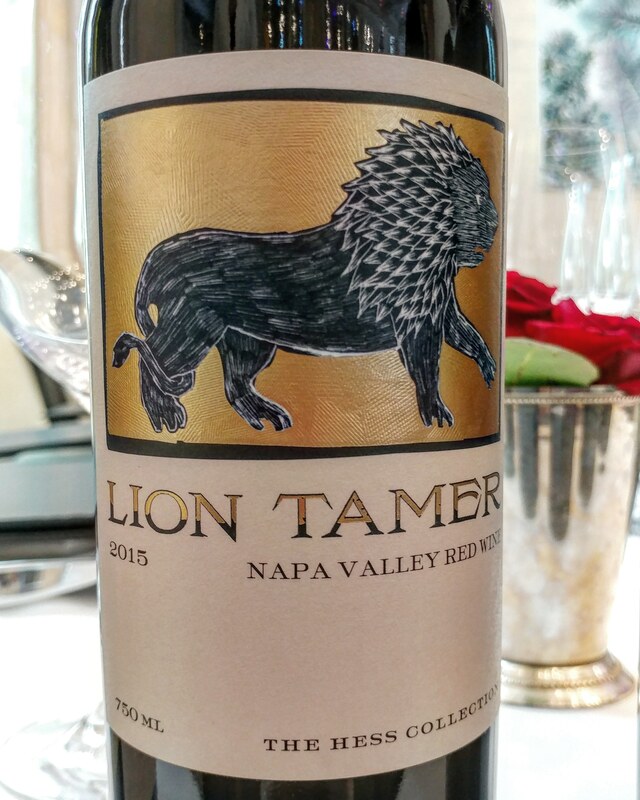 –2015 Hess Collection, ‘Lion Tamer’, Red Blend, Napa Valley: 50% Malbec, 23% Zinfandel, 11% Petite Sirah, 6% Cabernet Sauvignon, 4% Petit Verdot, 4% Merlot and 2% Mourvèdre. 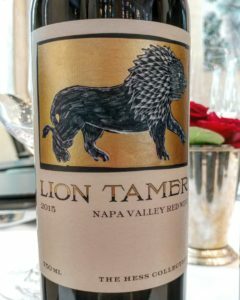 This wine stood out as a real favorite of mine because there is nothing like it that I have tasted and love the name: Lion Tamer. 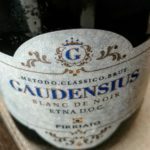 It is a real generous wine with lush fruit (plum tarts and blueberry pie) with a round inviting texture and pretty hints of violets and vanilla bean. 2015 had one of the earliest harvests on record and so the grapes varied in size and ripeness level and makes for some interesting drinking with ripeness and freshness present in these beauties. 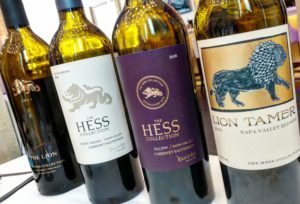 The name Lion Tamer is a nickname that Hess uses for Malbec since they use it as their tannin tamer – also, Hess has 2 wineries in Argentina that focus on Malbec and so they understand its great potential when grown at higher altitudes. This is the only wine that uses American oak but it goes so well… and as I like to remind those who may not know that not all American oak is created equal and actually some can have a lovely subtlety to them, such as this one. 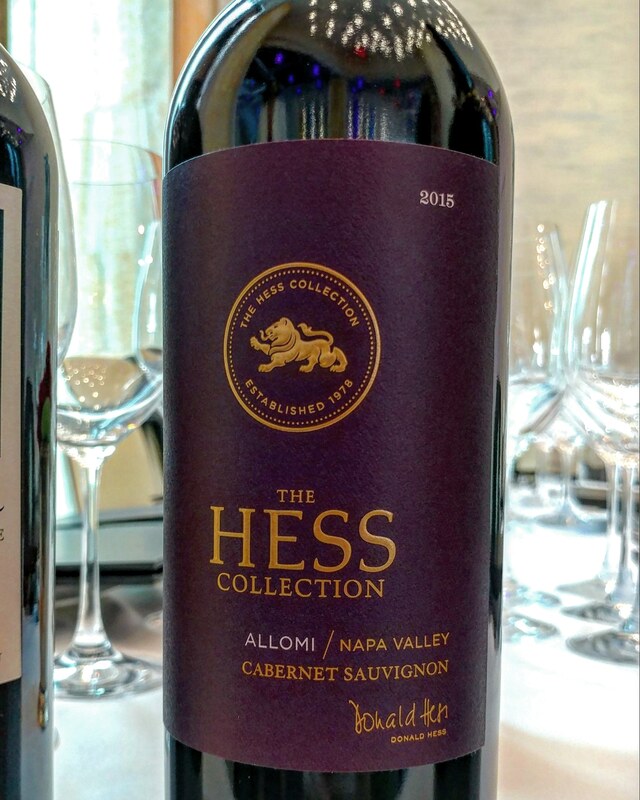 –2015 Hess Collection, ‘Allomi’, Cabernet Sauvignon, Napa Valley: 92% Cabernet Sauvignon, 6% Petite Sirah and 2% Petit Verdot. This wine had an intriguing earthiness to it with cracked clay and forest floor that had a touch of firmness in its structure. Black currant leaf with dark brooding fruit that was linear in its shape. Their Allomi Vineyard lies in the gently rolling hills of northeastern Napa Valley where the combination of a typically long, warm growing season and well-drained soils create optimal ripening conditions for Cabernet Sauvignon. The 210 acres (84 hectares) vineyard is focused into 35 unique growing blocks with 6 different Cabernet clones (biotypes) that add diversity of flavors and complexity to wine. In each vintage, their winemakers and viticulturists evaluate each block and select only the finest components for the final blend. Aged in 40% new French oak barrels for 22 months. –2013 Hess Collection, Cabernet Sauvignon, Mount Veeder in Napa Valley: 82% Cabernet Sauvignon and 18% Malbec. This wine has a wild, brambly quality that is cloaked in refined tannins and overall charm that really shows the beauty of Cabernet from the mountains. 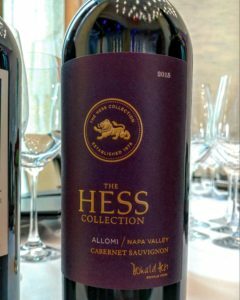 A dominant cassis note has layers of complexity with caramel, underbrush and enticing smoke with an elegant exit on the palate that shows the incredible skill of tannin management that Hess has acquired over the years dealing with cooler climate Cabernet. 2013 is simply described as “Early, even & excellent”. 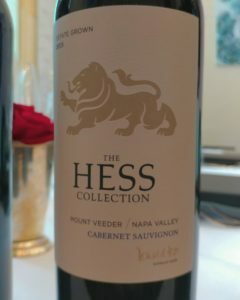 This is the Hess Collection’s signature Mount Veeder Cabernet Sauvignon which comes from their Veeder Hills Vineyard estate that Donald Hess bought in 1978. 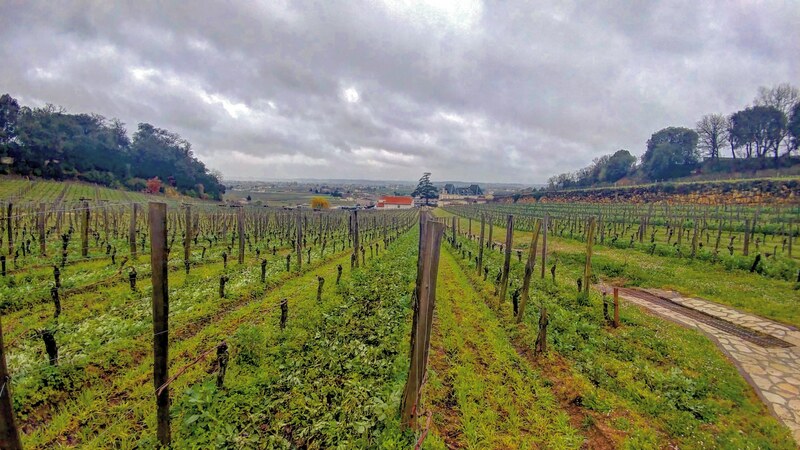 The elevation of this vineyard ranges from 600-1,120 feet (183-340 meters), and its steep slopes and sedimentary clay and shale soils restrict root growth, resulting in Mount Veeder’s hallmark small berries with intense fruit flavors. Aged in 80% new French oak barrels for 22 months. 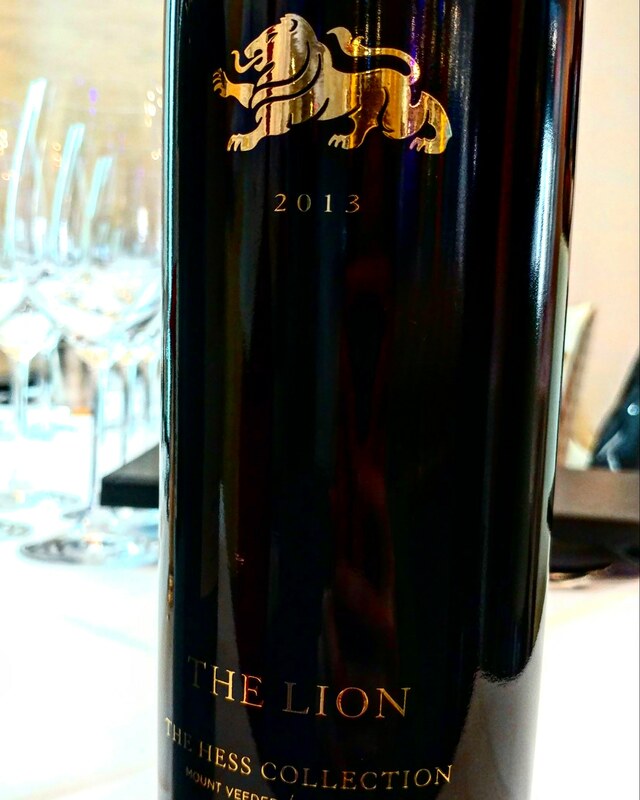 –2013 Hess Collection, ‘The Lion’, Cabernet Sauvignon, Mount Veeder in Napa Valley: 82% Cabernet Sauvignon, 17% Malbec and 1% Petit Verdot. From the first sip, this wine has a sensational depth of flavor with intense blue and black fruit that is multifaceted and multi-dimensional with a new delightful note revealing itself with each sip: cigar box, smoldering earth, cumin seeds, and cocoa. Powerful structure that is at the same time supportive to the fruit as well as welcoming with its fine laced quality and the finish is vibrant and lingers with exotic spice. This wine will probably be approachable in a few years but man does it have all the stuffing in the right places to continue to improve for 15 more years. The Lion has been the emblem of the Hess family for many generations. 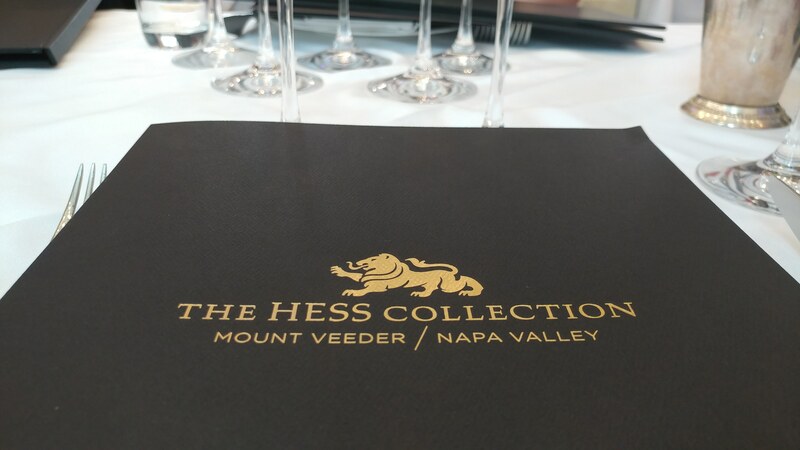 It has come to symbolize the bold and preserving nature of founder Donald Hess and their winery home on Mount Veeder. “Live Each Day with the Heart and Courage of The Lion” is the Hess family credo and The Lion Cabernet Sauvignon represents the very best Cabernet they produce from their estate vineyards on Mount Veeder in the very best vintages. The 2014 marks the second vintage that is a winemaking collaboration between consulting winemaker Celia Welch and Hess winemaker Dave Guffy. Aged in 65% new French oak barrels for 22 months. 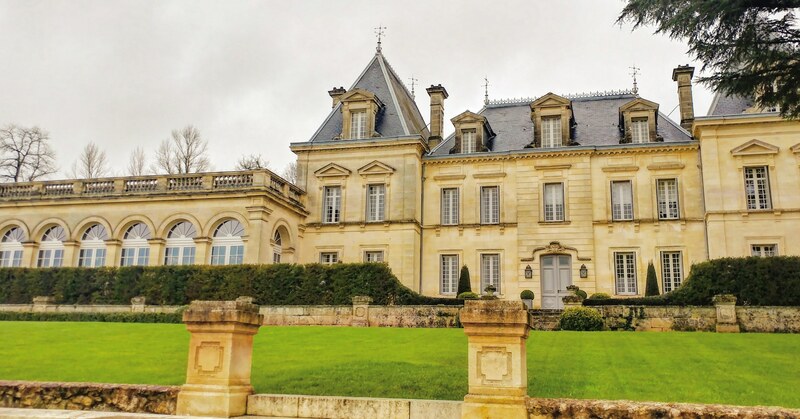 Every time I see a grand limestone French château, it is always a heart stopping moment. I remember imagining them when I was a young adult reading up on French history in a tiny, dingy library in my unsavory NYC neighborhood over 20 years ago. It was my only way to escape the grit during those times. It seemed like an impossibility to actually witness such a place with my own eyes but life can be funny, and through the twists and turns, some good and some bad, one can end up in the most interesting places. 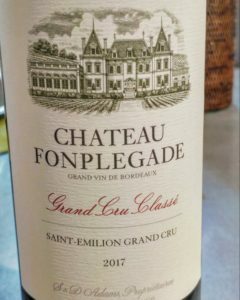 One such exquisite château that I experienced recently is Château Fonplégade, a Grand Cru Classé in the UNESCO World Heritage Site Saint-Émilion, in Bordeaux, and interestingly enough, it was bought by an American couple, Denise and Stephen Adams. 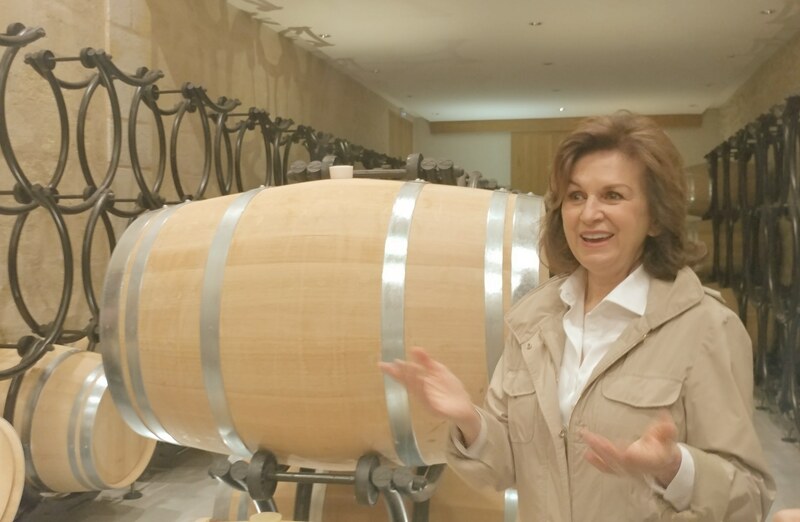 During our visit to Château Fonplégade, we were greeted by Denise and her director and technical manager, Eloi Jacob, for a tour of the vineyards, winery and the château. There was so much thought put in every aspect of Château Fonplégade – from the warm and inviting gift shop and sitting area, to their cellars using partial Austrian oak to express their limestone plateau vineyards, to their dedication for every single vine on their land with their commitment to organic, certified with Ecocert in 2013, and to biodynamic practices, fully biodynamic in 2017 and waiting for the certification. Denise said that they like to think of themselves more as stewards of this special piece of land than simply just property owners. 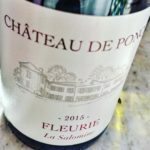 She grew up on a farm in the Midwest and so she finds herself happily spending the majority of her time in the vineyards and lives at Fonplégade most of the year. 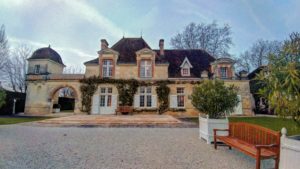 Denise and her husband always loved traveling to Bordeaux and dreamt of owning a château with vineyards which seemed impossible for so many years since the opportunity was never there… until one day when they visited Château Fonplégade. 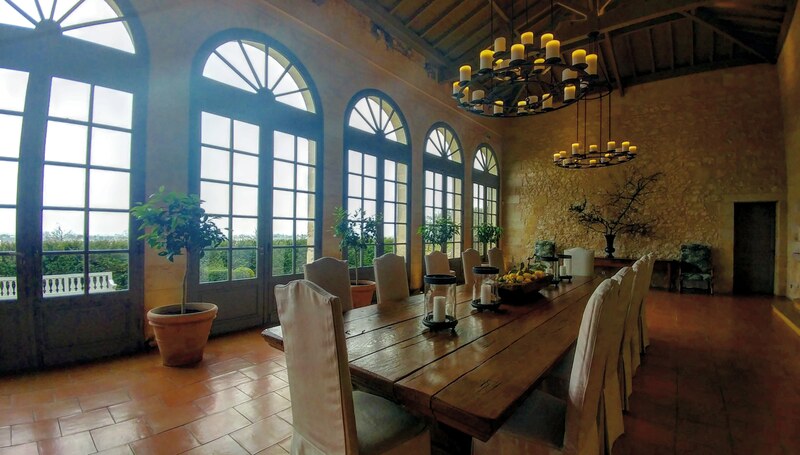 Although this château needed lots of work to restore the buildings as well as the vineyards, Denise could see the potential and she spent many years, since first purchasing this estate in 2004, with her head down trying to bring back its former glory. 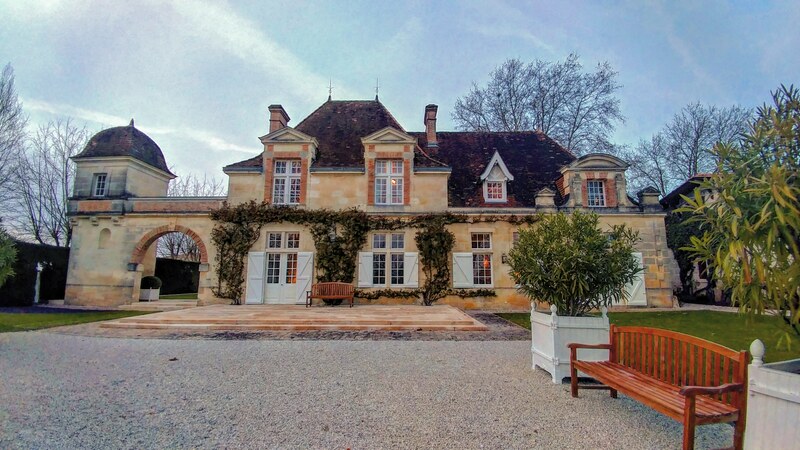 Sometimes I think there is an unfair prejudice to “outsiders” buying estates in places like Bordeaux, as the judgment is already passed down before they have been given a fair chance. But I do understand the community itself having a wait and see attitude – because it takes time to truly know someone’s intention. 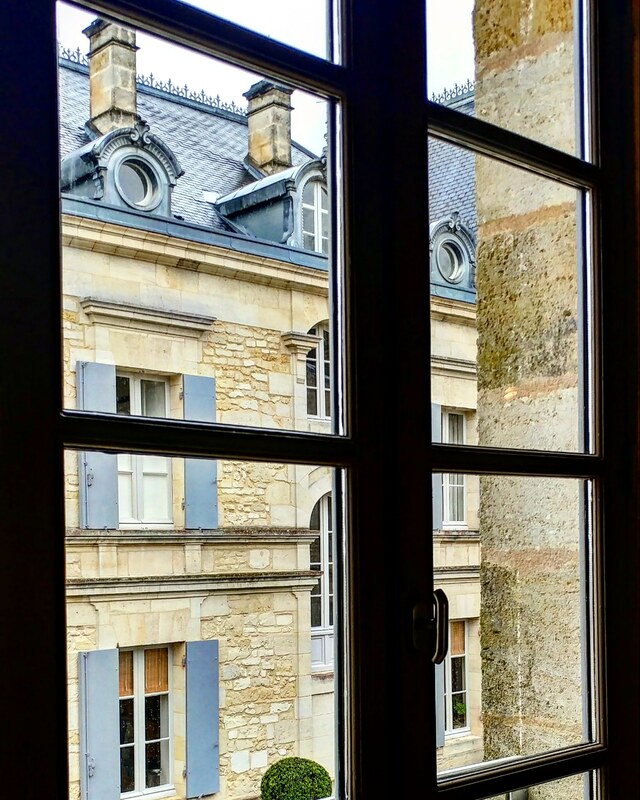 Denise said that at first they didn’t feel completely accepted, and she understood that the people of Saint-Émilion needed to know if Denise and her husband were there for the long haul. She said the turning point where the community opened their arms to them was when they rebuilt the East tower of the château that was burnt down during WW II. Denise is not only a person of the land but, with a degree in art history, she had a profound respect for the importance of restoring the tower as a cultural symbol of the area. 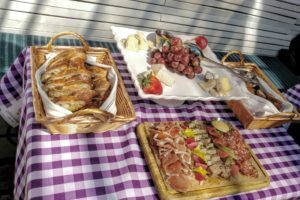 Now there is an outpouring of invitations sent to Denise and her husband and their social calendar is booked with Saint-Émilion community gatherings. On the day I visited, Denise had to excuse herself early as she was being inducted into the Jurade of Saint-Émilion, the appellation’s vinous brotherhood, which now includes non-French as well as female members. 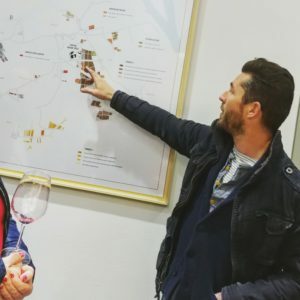 I’m not saying that it always works out for the community when an outsider buys a beloved wine estate, but if we pride ourselves on being open-minded people, then we need to fight that impulse of throwing stereotypes around, no matter the situation. 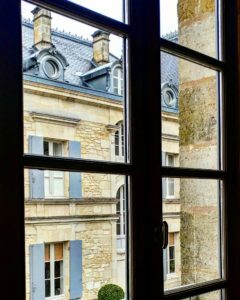 It warms my heart to see Saint-Émilion opening their heart to Denise and Stephen Adams as well as them being truly ideal examples of conscious custodians that are bringing back the beauty of an estate that at one time seemed lost. 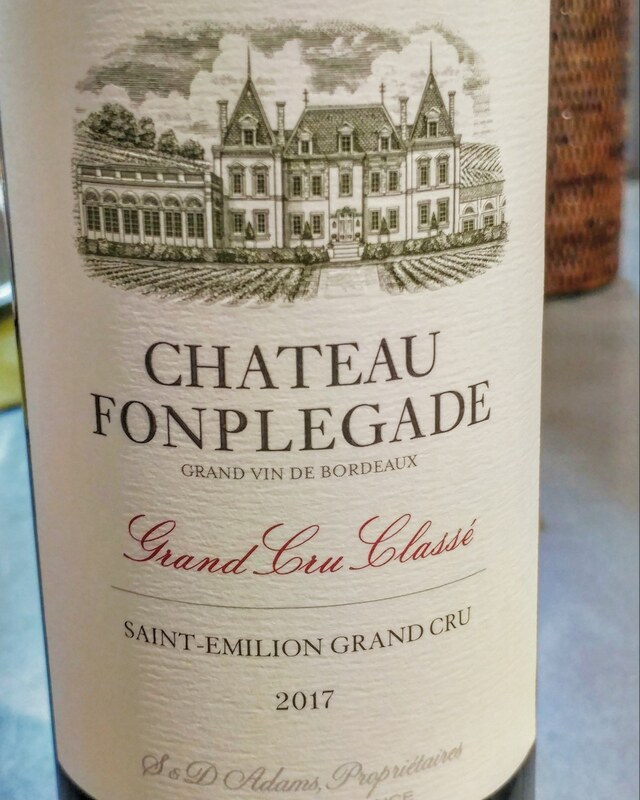 Side Note: 9 native yeasts from the Château Fonplégade’s vineyards are used in the below wines that were based on blind tasting each native yeast they found and selecting the ideal expression of their terroir. 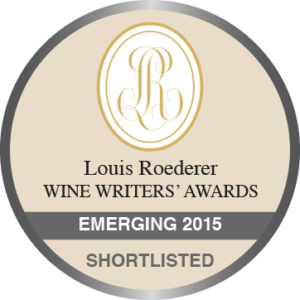 –2015: 95% Merlot and 5% Cabernet Franc. Rich body with firm, elegant structure that had notes of red currants, wild flowers, tobacco leaf and a saline minerality on the long finish. Harmonious with supple fruit that fleshed out the finely etched tannins. –2016: 90% Merlot and 10% Cabernet Franc. Muscular structure with incredible balance of fresh acidity, juicy fruit and layers of complex notes of exotic spice and chalky limestone note that expanded on the finish and wafted in my head as I remembered it for the rest of the day. This will be stunning with some cellaring. 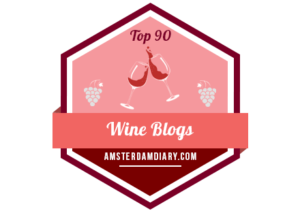 –2017: 90% Merlot and 10% Cabernet Franc. Pristine, lifted fruit was really breathtaking with added layers of star anise and dried rose petals with a pure and energetically sustained fruit that was touching with its unbridled expression of pretty fruit quality. The tannins were well-integrated and more of a linear shape drove this wine keeping it refreshingly addictive after every sip. I’ve always liked the aphorism “a rising tide lifts all boats” which is associated with the idea that if a group focuses more on the whole rather than the individual then all will benefit. Although placing a general focus on trying to improve an economy as a whole, considering all the various levels of social stratification and whether thinking of a region or country, is certainly a good mindset, it does have its issues with many still falling through the cracks of the system. And so it takes real leaders to help strengthen, or fortify, those individuals who have been given very little chance in life to eventually help themselves; leaders who have the courage and desire to take on the challenges that come from taking responsibility for everyone in their community. When I was young, in my early years in New York City (NYC), I originally had no support system… no family, no resources, and no guidance. I was an 18 year old that knew nothing of how to navigate through life and found myself in a lower income NYC neighborhood surrounded by strangers. When I first came to the city I felt like I had so much adrenaline stemming from the pure excitement of being in one of the greatest cities in the world that I was able to get past many of the challenging obstacles initially… but through time, that energy starts to fade and the barrage of various difficulties, amplified by living a life without any support system or direct leadership, became almost unbearable at times. Yet there were moments when I was at the end of my rope when my community helped me… the times they waved my fees at my local health clinic, the times my neighbors in my tenement apartment (who had a lot more responsibilities than I did and barely got by themselves) shared their food, and the multitude of times that someone with a great education, incredible mind and fierce talent was willing to teach me a myriad of things that have allowed me to be where I am today. I realized during that time the importance of community and despite not everyone having the wiliness to help themselves, many of us who were lost kids benefited from those “leaders” who helped to fortify us so we could pull ourselves up by our own bootstraps. 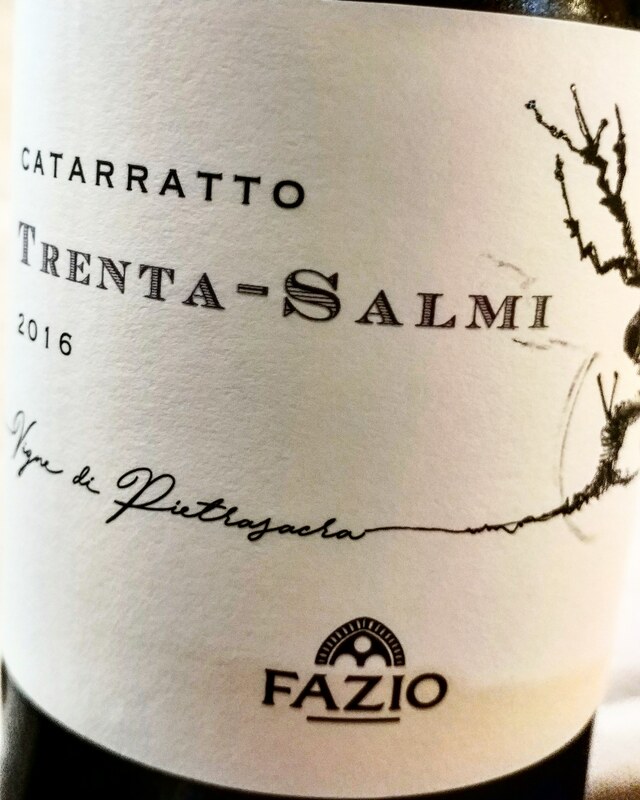 When I visited Fazio Winery in the North-West of Sicily, Italy, I had a feeling right off the bat that they were leaders in their Trapani province and were key in building the Erice DOC reputation to receive such a respected wine quality designation. 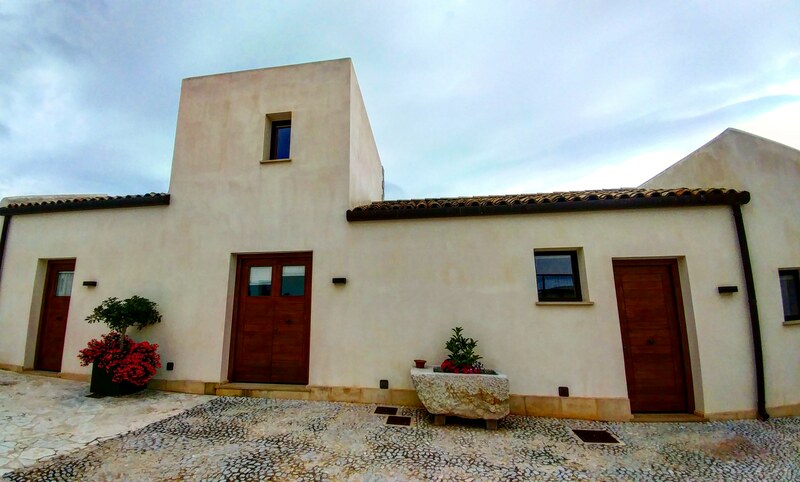 Erice is not only known for its historical significance and culture as being an ancient town that was once a key medieval citadel in the Trapani province, it has also become a center for scientific research and Fazio has certainly assumed the mantle for advancement in viticulture and winemaking. 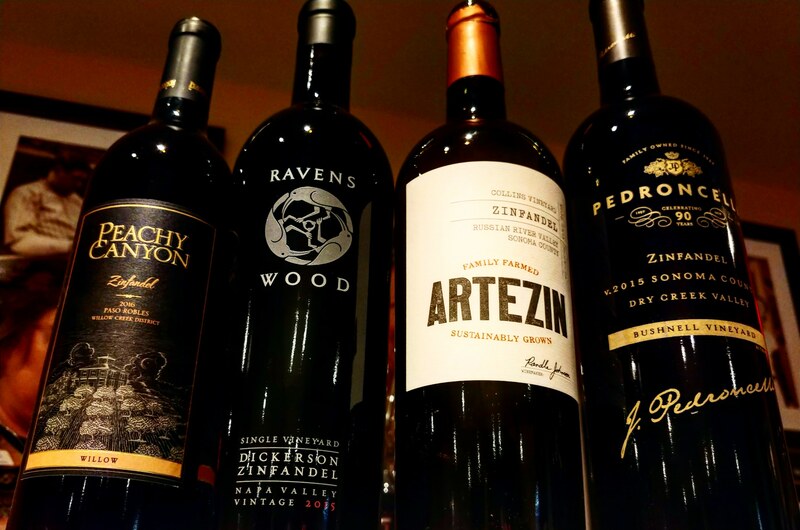 As a family business, Fazio has transitioned as the second generation focused on improving wine quality not only at their own winery and vineyards but working with other grape growers in the area. Lilly Ferro, our guide for the day, said that her parents-in-law started the company 60 years ago. In the 1980s, her husband along with brother-in-law and winemaker Giacomo Ansaldi made the commitment to focus on quality in every aspect. 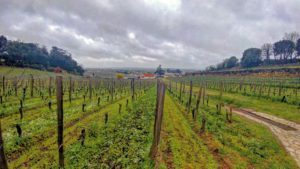 They have around 247 acres (100 hectares) of their own vineyards and they work with other growers that add another 741 acres (300 hectares). They don’t just buy the grapes from the growers but they come in and analyze the soil, aspect and topography and determine the best vines and management for each vineyard. As we walked through their extremely modern and updated winery that handled every step in the process, including the vitally important bottling procedures, I was impressed by their experimentation vineyards dedicated to trying out recently discovered indigenous (autochthonous) varieties of various clones (biotypes) that would be a benefit to the area as a whole. 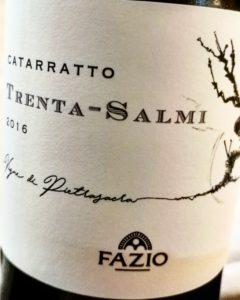 When we had our tasting of the Fazio lineup, I happened to sit next to the woman,Valentina Console, who designed the labels and she said that the wines inspired the various labels. Her thoughtful creativity was evident and it was wonderful that she was given the support by Fazio to allow her artistic gifts to shine. 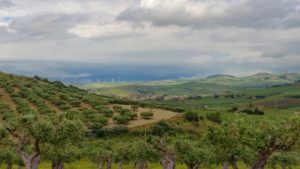 Throughout this trip I kept thinking about this winery, how the language was always pointing towards not only Erice DOC’s potential, but Sicily’s potential as well. My last couple of days in Sicily were spent at the 2018 Sicilia en Primeur in Palermo – the newly anointed “Italian Capital of Culture.” My days were spent attending various Sicilian master classes and tasting a plethora of wines, as well as interviewing producers coming from all over Sicily. 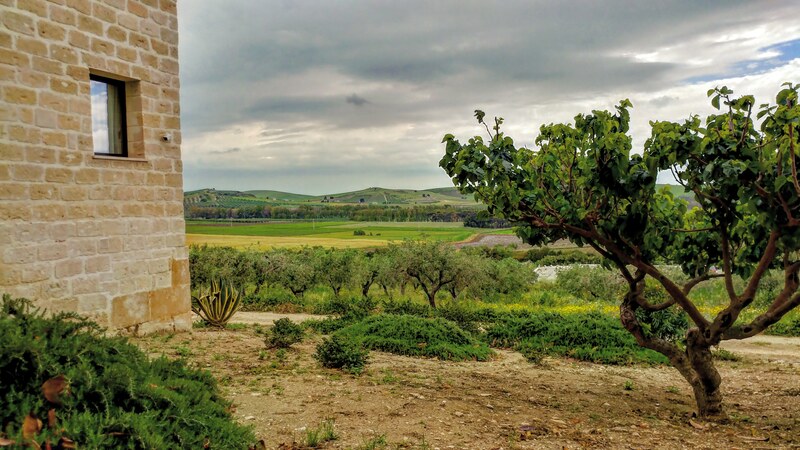 Throughout my time there, I kept seeing Lilly Ferro and I was always impressed by her passion to help the entirety of the Sicilian wine producers. Whether it was her talking about other producers she was impressed by during the master classes or her intense focus during the discussions of how the Assovini Sicilia (a group of small to large size wine producers) can improve the situations for all wine producers in Sicily, she was there with an obvious passion for strengthening the community; by the way, she is on the Assovini Sicilia board of directors. At one point, we were standing by the espresso bar at the Sicilia en Primeur and Lilly said that I should try a biscotti-like square because it was made by boys who had behavioral problems – she said it was important to give them some sort of skill, some sort of chance. In that moment I had an intense vision of the series of points in time where people gave me a chance – a chance to survive and thrive… that I found myself many years later in Sicily on a wine press trip writing about wine and living a life more fulfilling than I could have imagined seemed liked a “pinch me moment” of joyous disbelief. Sooner or later, all of us need to be able to handle the tides that life will throw at us, but we do not come into this world already fortified for the severe impact that some of those tides will carry… that is where leaders like Lilly Ferro and her family’s winery Fazio become essential to help us to strengthen our own boats, so everyone will have that opportunity to build a life with a few pinch me moments of joyous disbelief. 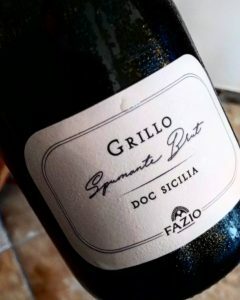 –NV Spumante Brut, Grillo, Sicilia DOC: 100% Grillo. Dry Charmat Method sparkling wine. 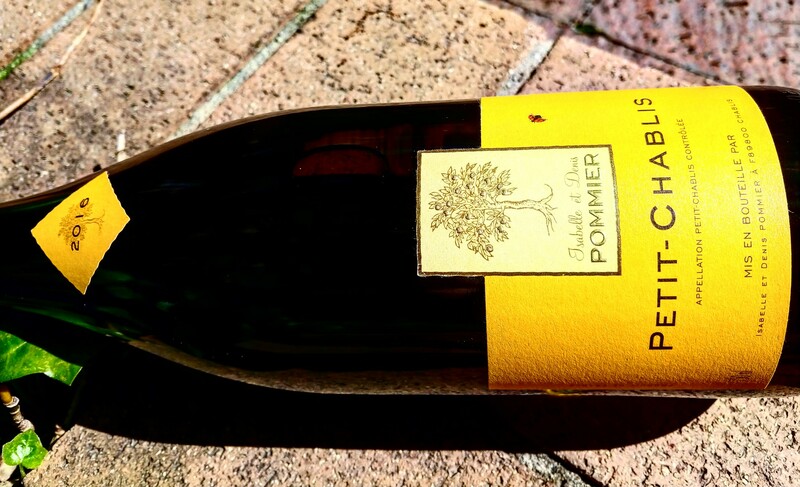 Lemon confit, creamy bubbles, and saline minerality – only 4g/l residual sugar. Grillo is a crossing between Catarratto Bianco and Zibbibo (Muscat of Alexandria) in Agrigento, Sicily in 1869 by Baron Antonio Mendola and has become one of the most important white grape varieties showing incredible potential as a variety that can display a range of aromatics as well as body weight with always fresh acidity present. –2017 ‘Calebianche’, Catarratto, Erice DOC: 100% Catarratto. Blanched almonds with lots of salinity and chalky minerality that had a long citrus-y finish. 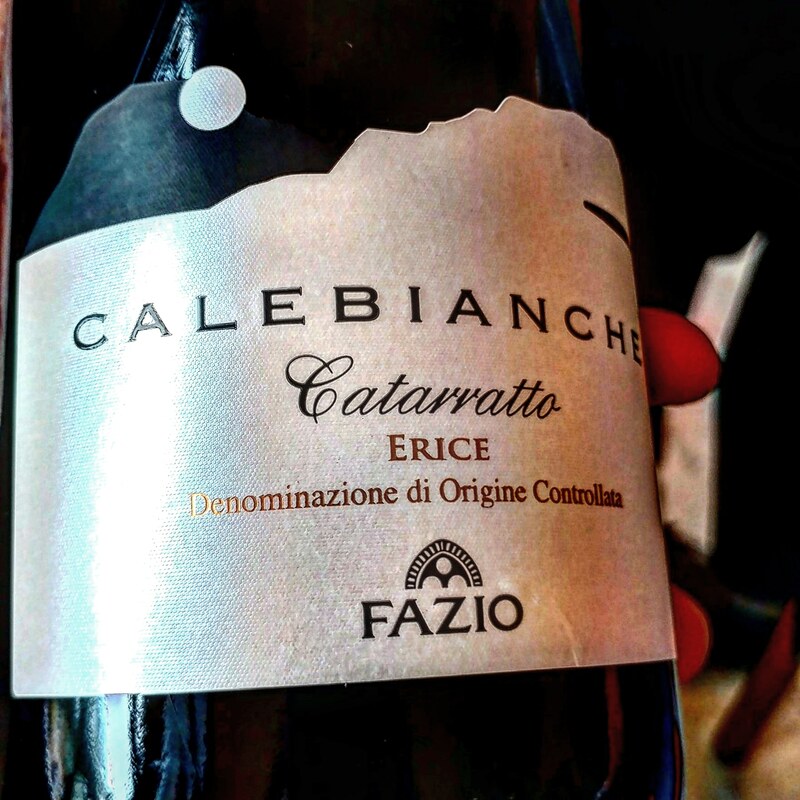 This Calebianche label, as well as the wine below, Aegades, is to give the feeling of island life in Sicily: the sun and the sea with the waves. –2017 ‘Aegades’, Grillo, Erice DOC: 100% Grillo. Zingy, wet stones, orange zest and lime blossom with a mouth watering finish. –NV Vino Spumante Brut, Müller-Thurgau: 100% Müller-Thurgau. Dry Charmat Method sparkling wine. This 2017 had an enticing smoky minerality note with peach skin and lemon rind that had a linear, saline finish. Fantastic wine! 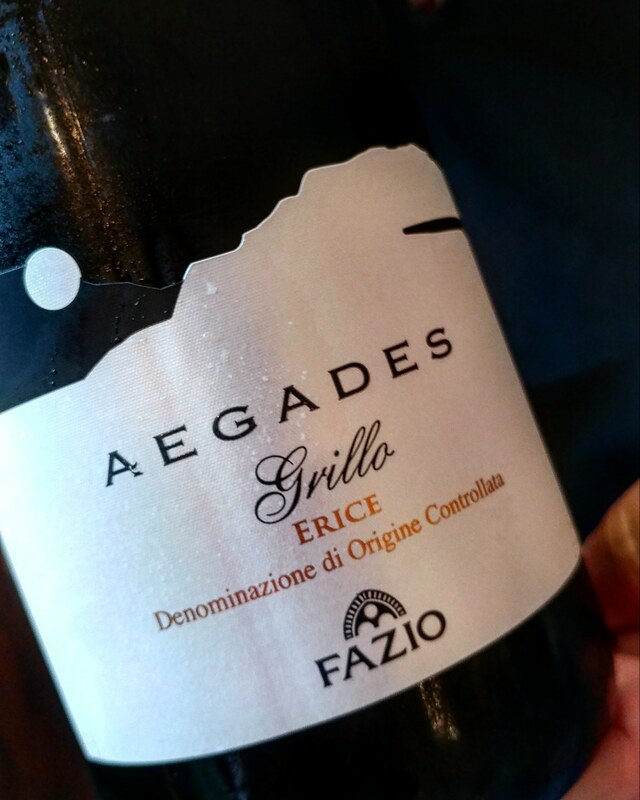 Fazio has received a lot of acclaim for this wine which comes from a single vineyard grown on top of a hill (around 1640 feet (500 meters) above sea level) and these are the first vines harvested around the end of July, beginning of August; there are also swings of temperatures that can be as great as 20-25 degrees difference between day and night during the summer… this creates a wine with ripe fruit, fresh acidity and a sense of minerality and place. 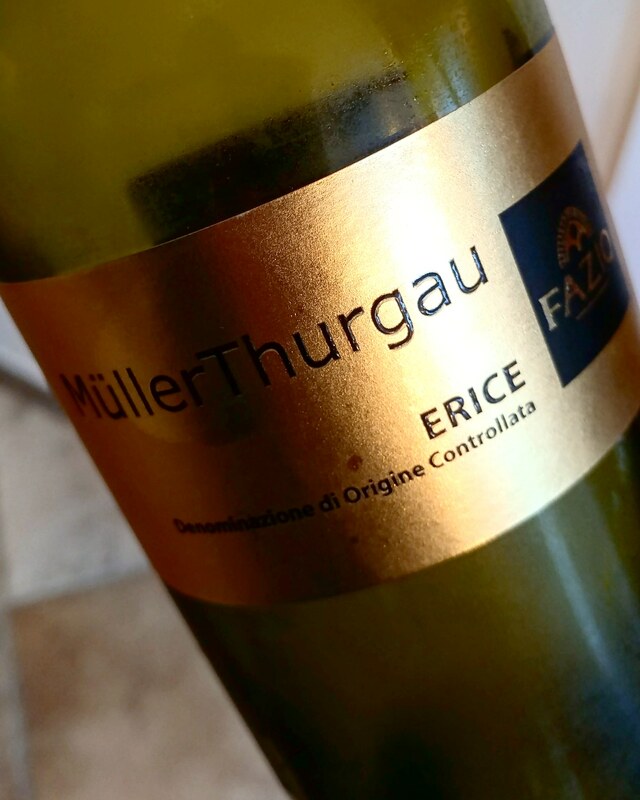 Although it is not an indigenous variety of Sicily (Müller-Thurgau is a crossing created in Germany) Müller-Thurgau has certainly found a home in Erice DOC. 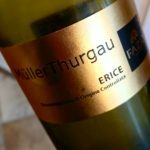 –2017 Müller-Thurgau, Erice DOC: 100% Müller-Thurgau. Flinty minerality with orange blossom and marked acidity that had lots of energy on the finish. 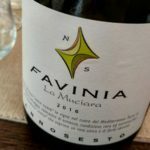 –2017 ‘Castelmedio’, Nerello Mascalese, Terre Siciliane IGT: 100% Nerello Mascalese. This is Nerello Mascalese from calcareous soils as opposed to the volcanic soils of Etna. Rich black cherry and blueberry pastry notes with a pretty floral hint that had a round, soft plush palate. 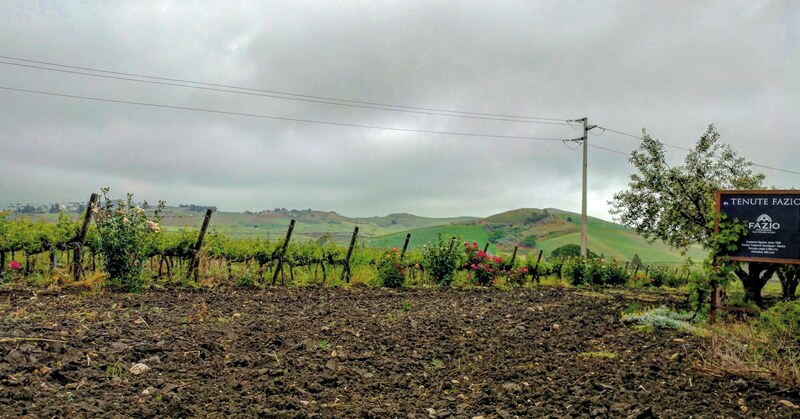 I really liked experiencing another expression of place from Nerello Mascalese. 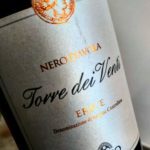 –2017 ‘Torre dei Venti’, Nero d’Avola, Erice DOC: 100% Nero d’Avola. Deep ruby color with dusty earth, rich and round with blackberry notes. –2016 ‘Cartesiano’, Rosso, Terre Siciliane IGT: 40% Cabernet Sauvignon, 30% Merlot, 20% Nero d’Avola and 10% Cabernet Franc. Hint of mint with dried blackcurrants with textural contrast of firm tannins that are fleshed out with lush fruit. 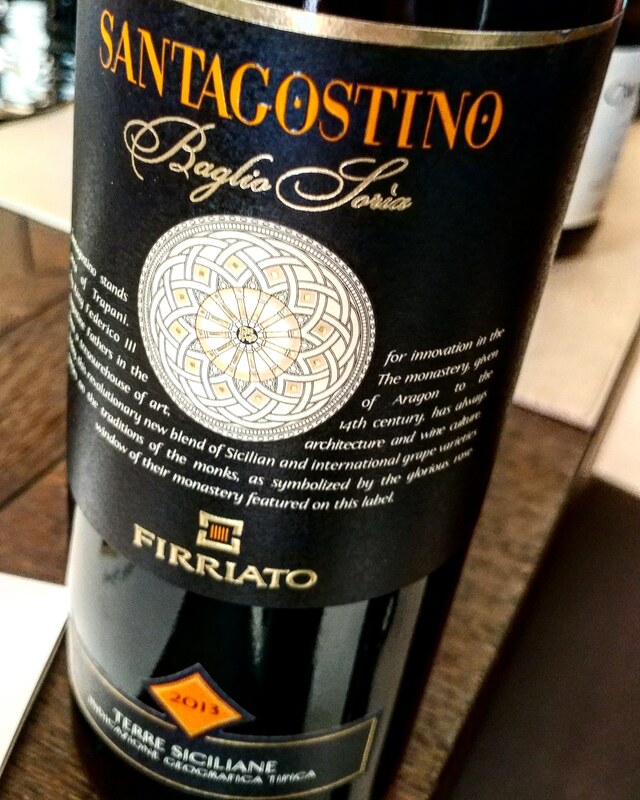 Although Fazio has a focus on indigenous, single varietal expression, this bottling shows the sense of place of the Erice area with a mainly Bordeaux blend that is Sicilian style with the Nero d’Avola added. The Cartesiano label shows the old vines that are prevalent in the Erice DOC area. The fabulous woman, Valentina Console, who designs all the wine labels for Fazio holding the PietraSacra. –2010 ‘PietraSacra’, Rosso Riserva, Erice DOC: 100% Nero d’Avola. 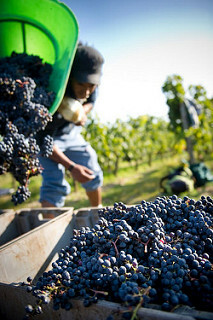 Fazio’s “Elegant Reserve” of one of the most important Sicilian varieties – the king – Nero d’Avola. Sour cherry, lots of fun tang with a hint of spice and added complex notes of chestnut and juniper along the well-structured body and long, expressive finish. The grapes come from their “premier cru of Erice DOC”. This wine sees French oak but the winemaker Giacomo Ansaldi constantly checks on the barrels to make sure that the oak is only helping to express more of the variety and sense of place and not overpowering the wine itself. 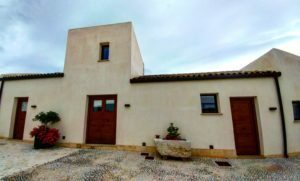 –2016 ‘Trenta-Salmi’, Catarratto, Terre Siciliane IGT: 100% Catarratto. From old bush vines that are over 60-year old that give a low yield. 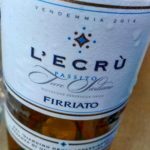 This is the only dry white wine that uses oaks – fermented in barriques. A stunning wine with nutty, crumbly rock notes on the nose and becomes wide and rich with tropical fruits on the palate that finish with a lifting hint of sea breeze. The opaque, sapphire sky was partially lit up in our little piece of nirvana. 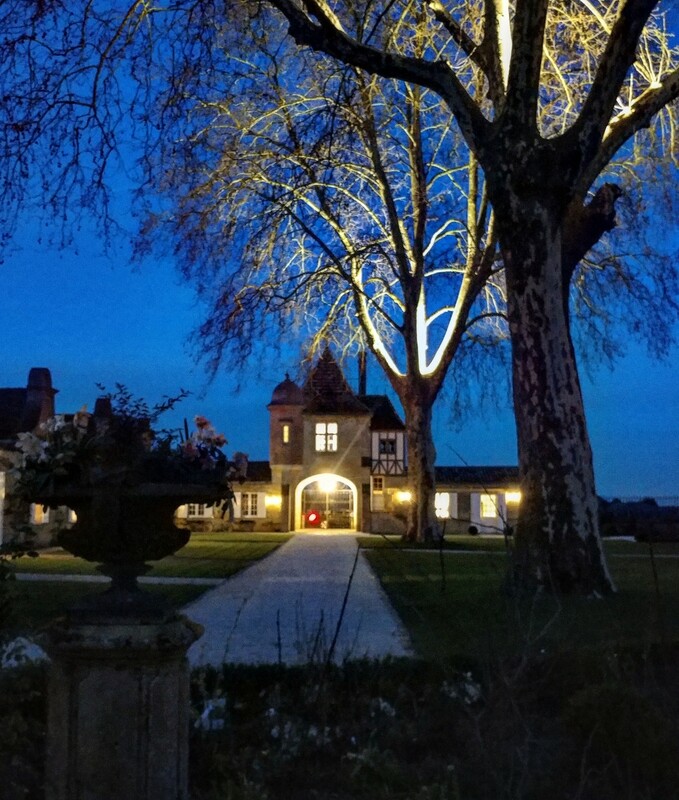 The bare branches on the trees slightly drooped down to help create a canopy of light that was shone from the Perigord-style building in the distance. As I slowly walked along the pebbled path, I was overwhelmed by the whole scene: little flowers highlighted in the ambient light combined with our divine natural awning; I felt how precious it was to experience their beauty in an amplified way. It made me think of all of those people, who were not necessarily religious, but who prayed to nature everyday, many of them winemakers, many of them lived in France. 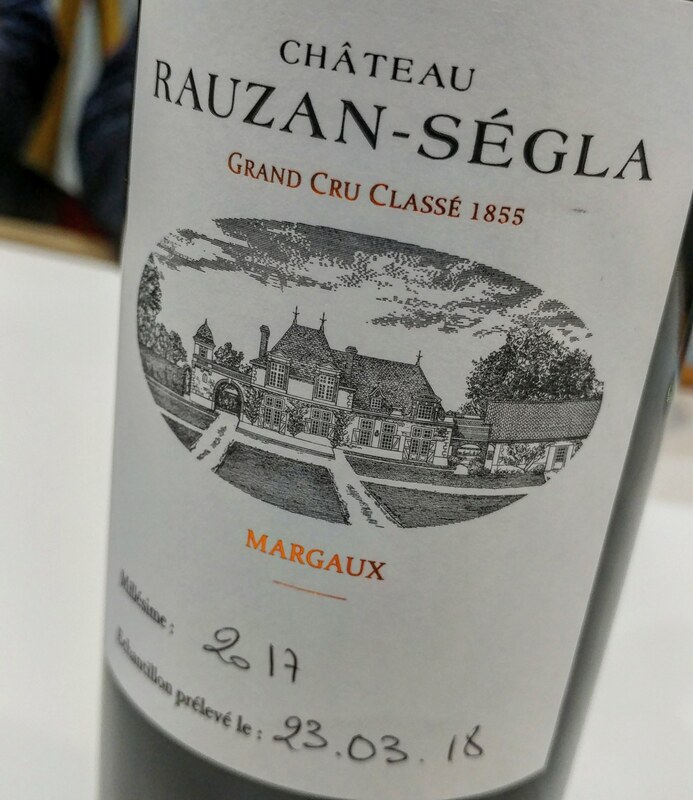 I was finishing my evening at the Second Growth, Château Rauzan-Ségla, in Margaux, Bordeaux – a special wine growing area in France. 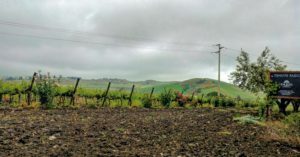 A second growth that has always had the great terroir of clay-gravel, encompassing the much sought after 4th terrace with fine, deep gravel underlying a significant portion of their plots – near the legendary Palmer. In the past, Château Rauzan-Ségla sat in the shadow of its acclaimed neighbor Château Palmer, but since 1983 there has been an influx of investment from owners, such as the current proprietors, the Wertheimer brothers (owners of Chanel), that wanted to bring this estate to its original glory with the 2016 vintage already showing some outstanding characteristics out of the gate; and although I haven’t tried the 2015, many wine colleagues have been raving about that vintage as well. 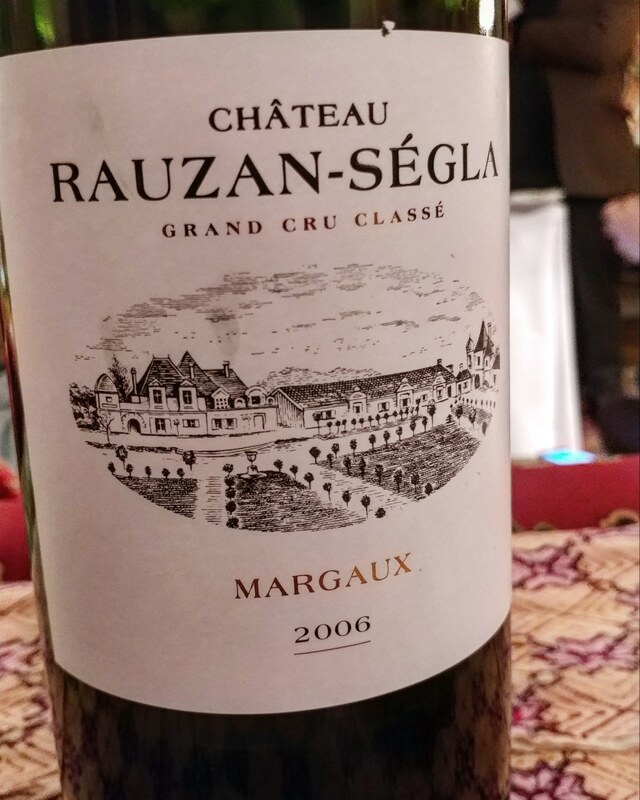 It is certainly impressive that their 2017 was a top wine as well since it is a vintage with varying quality levels, but Rauzan-Ségla is on the up side of that curve. During a work trip to Bordeaux to mainly focus on the 2016 vintage, I was invited, along with other wine writers, to visit the Rauzan-Ségla estates with a tour of the cellars, tasting, and a gala dinner that was elegant yet relaxed as we lounged on big, comfortable couches (designed in fantastical patterns) sipping our 1986 Rauzan-Ségla. Nicolas Audebert, the managing director, was our tour guide, who emphasized that their focus in the cellar was to enhance what was in the vineyards, and Rauzan-Ségla has some impressive soils that date back to 1661. They have around 185 acres (75 hectares) with 173 acres (70 hectares) in production. There are over 200 different plots that have been designed for various reasons: variety, clone of that variety, small change in composition of soil, and age of vines. Actually, they do over 200 individual vinfications and have that many pieces of any particular vintage orchestra to compose a symphony; hoping one day it will be talked about with cherished memories for decades to come. I had one of those moments while the words of Nicolas Audebert landed deep within my consciousness as I tasted their 2016 and 2017 samples; the powerful silky textures, the beguiling aromas, the enticing flavors… the energy, the spirit, the life. 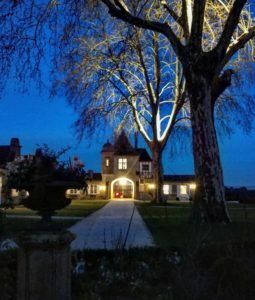 Before I knew it, I was outside walking away from the château and seeing the same picturesque setting as the one that I first encountered just a handful of hours earlier, but this time in a blanket of darkness with the few up lights helping to guide our way. I found myself lagging behind the group, kneeling on the ground, thinking about these winemakers and how they prayed everyday to their soil; I picked up a few pieces of dusty earth and thought about how so many living things are brought into this world, as well as taken, from what I was holding in my hand in that very moment. It is truly a miracle anytime we or anything else are living, such as the little flowers I could see around, thriving in the cold, damp air, or the leafless trees that would soon enough be covered with multicolored foliage; so many miracles that surround us everyday but we are just a prisoner to the grind of our life that often times we are not able to appreciate it… except for those few moments, such as walking away from a night of great wines, when we are grateful to still be alive. Disclosure: Millésima paid for my travel and first two nights stay in Bordeaux. 2017: 62% Cabernet Sauvignon, 36% Merlot and 2% Petit Verdot. 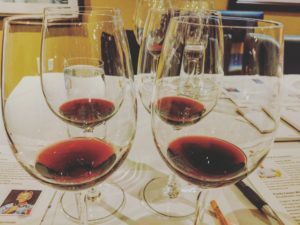 The wines in 2017 vary greatly and so one needs to do their homework and choose wisely. 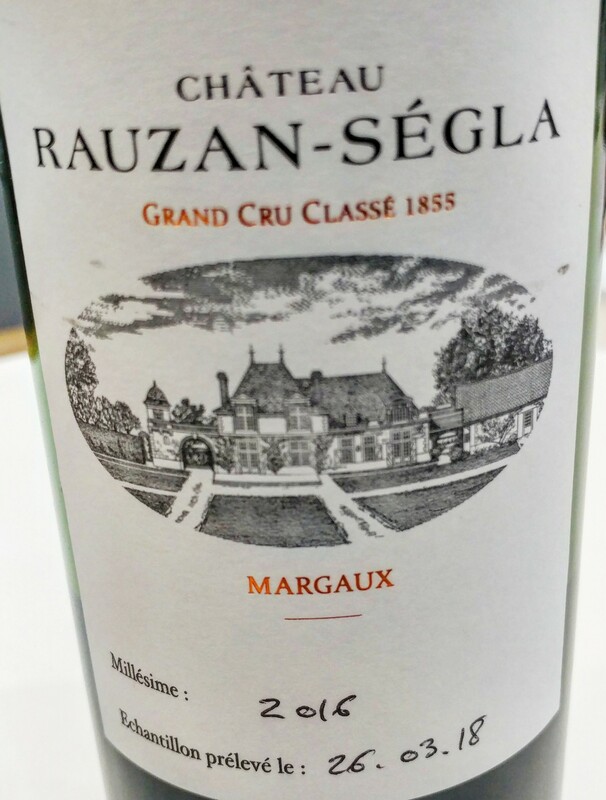 This Rauzan-Ségla is a rock star for the vintage and is already lush with ripe blackberry fruit and intoxicating smoky minerality and floral notes with a long, bright finish. 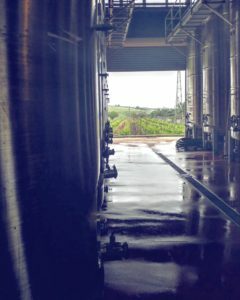 It had already gone through MLF and Nicolas Audebert noted that their wines typically go through malolactic fermentation early. 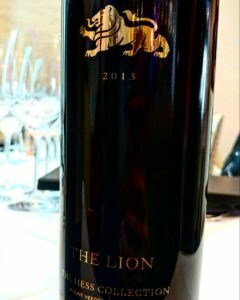 2016: 68% Cabernet Sauvignon, 30% Merlot and 2% Petit Verdot. Blueberry pie, spice and fresh sage with finely knitted tannins. 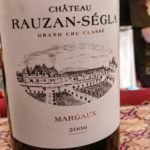 I was completely seduced by the generosity of juicy fruit and spice with this 2016 Rauzan-Ségla…. already singing at this stage; a winner out of the gates! 2006: 53% Cabernet Sauvignon, 44% Merlot and 3% Petit Verdot. This wine was a pleasure, with well-integrated tannins (not all 2006s are overly tannic) and good amount of concentration with cassis, black plums and smoldering earth. 1996: This wine offered a lot on the nose with a bouquet of lilacs, rose water, orange blossom and raspberries. It was more restrained on the palate with etched tannins and an expressive finish. 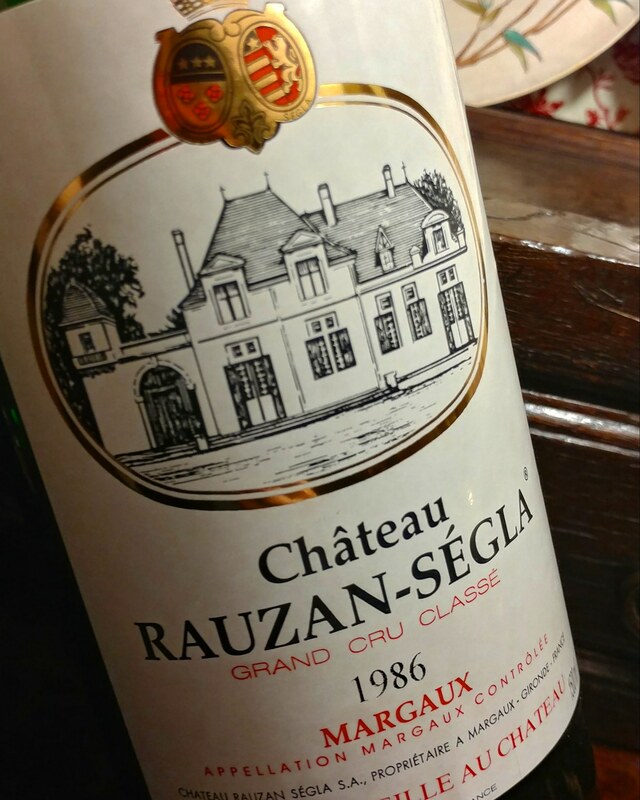 1986: This was the wine of the night and a great example of one of those dangerous libations that can start an addictive habit of wanting to only drink older Bordeaux. It’s not so easy to still find wines from the 80s that are still performing this well. So Bravo! Enticing notes of truffle with forest floor, saline minerality and sweet tobacco with plenty of dried red cherries to flesh it all out. It has a graceful presence with finely-sculpted tannins along an extraordinarily long finish. I have a feeling it’s towards the end of its peak, but what a way to go out. I would like to leave this life with such grace. A lie that so many of us tell ourselves is that we are all alone, that our actions have little effect on the rest of the world, and the rest of the world has little effect on us. We take that idea even further thinking that somehow, the only way to succeed is to be in direct competition with other countries instead of realizing that all of us are affected by the same global tide that brings us up at times, and unfortunately, at others brings us down. 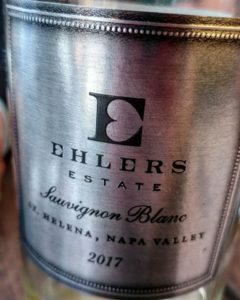 Ehlers Estate is a 100% estate grown winery tucked away between Howell Mountains and the Mayacamas in Napa Valley; interestingly enough, this winery is an ideal example of bringing the French wine tradition together with the spirit of American entrepreneurship. 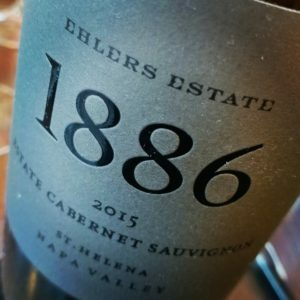 Ehlers Estate was established during the times of the Wild West when Bernard Ehlers, a Sacramento grocer who made his fortune by selling prospecting tools to those in search of gold, built the stone barn winery in 1886 and replanted the vineyards surrounding it. 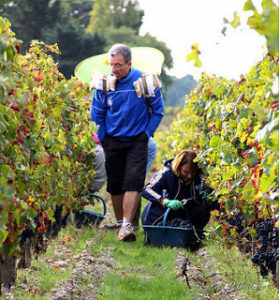 Ehlers Estate would go through a few owners before they found their true custodians in Jean and Sylviane Leducq. 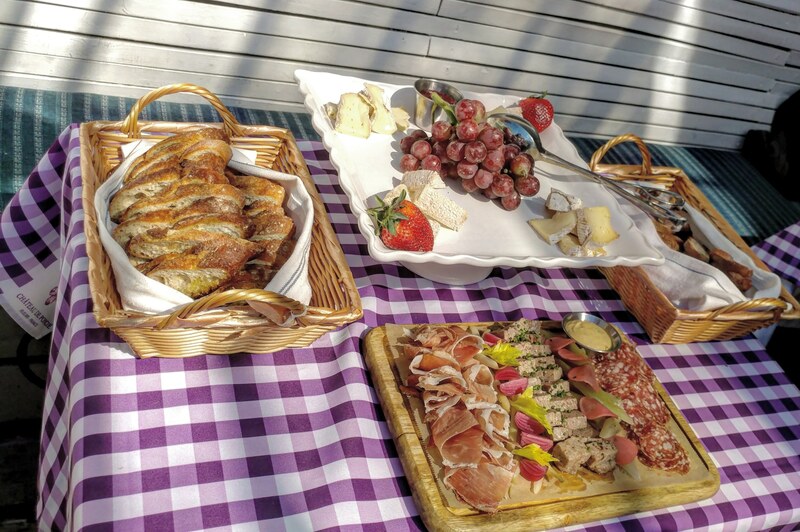 Jean and Sylviane were a French couple that married at the end of World War II whose love for food and wine was at the center of their mutual passion for life. 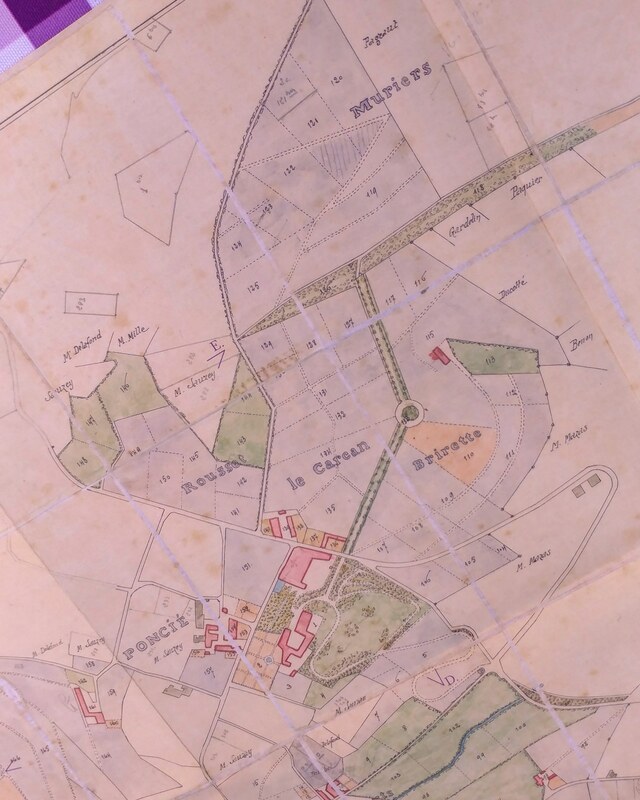 Although they were proud of all things French, their lives were enhanced by expanding their various businesses into the US where Jean’s entrepreneurial spirit thrived. Jean’s love for America was cemented in the mid-1970s when he suffered from a suspected heart attack and was later treated at the Mayo Clinic in Rochester, Minnesota, where he was the beneficiary of the then-revolutionary technology of coronary artery bypass surgery. His heart may have been born in France but it was saved in the US. 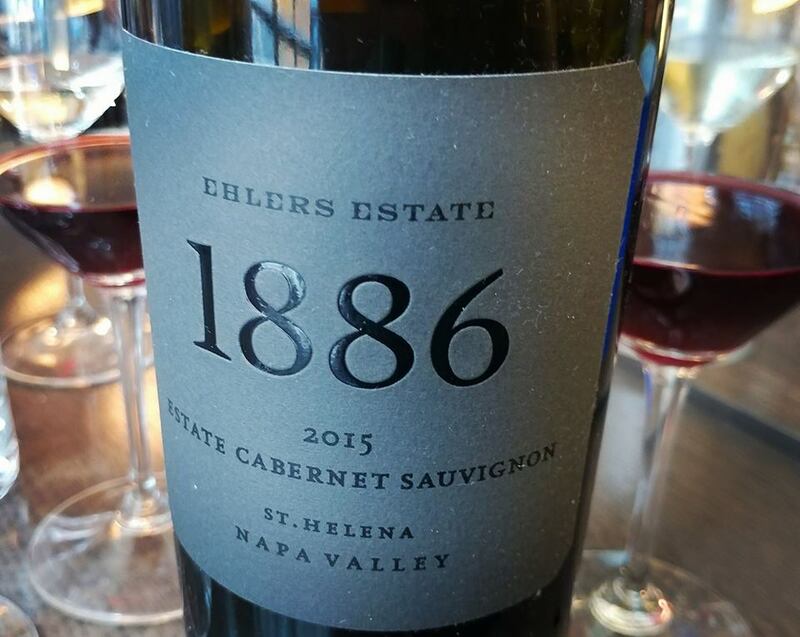 The Leducq’s love for Bordeaux wine and Jean’s feeling that anything was possible in America led them to buy Ehlers Estates in Saint Helena, Napa Valley. At first, in 1987, it started with few acres until they were able to purchase the stone winery, built in 1886, and reunite the original 42 acres (17 hectares) together. 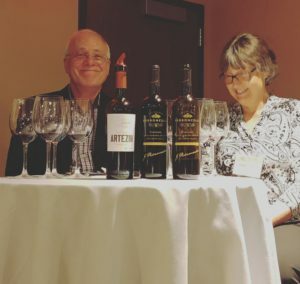 They only have the highest standards as they believed that their piece of Napa heaven could be as good as the top Bordeaux wines they had enjoyed throughout their life. What better person to become the winemaker for Ehlers Estate, the Leducq’s baby, than someone like American Kevin Morrisey, with whom I was able to have lunch a little over a week ago. As a cameraman in his previous profession, he found himself many times in France, especially Paris, and was raised going on VW camper trips across Europe with his parents. At the age of 35, after a decade-long career in film, he would find his true destiny on the winemaker path. After studying at the top enology school in the US, UC Davis, he was determined to have an internship with one of the best producers in France, and some may argue the world, Château Pétrus, and yes, they finally accepted him after he bombarded them with calls, emails and faxes. 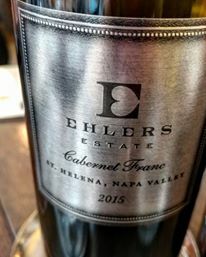 Then, after working at a couple of the top wineries in California, he finally completed the circle by bringing his French and American sides together becoming the winemaker of Ehlers Estate in 2009. Ehlers Estate was already 100% organic and farmed using biodynamic practices before Kevin arrived which made it that much more of the right fit since both of his daughters were raised in Waldorf schools – based on Rudolf Steiner’s educational philosophy (he was also the founder of biodynamic agriculture). In Ehlers Estate, Kevin had found a company that embraced the same values and high standards that he set for himself everyday with a holistic philosophy that brought everything together. Jean Leducq passed away in 2002; his wife, Sylviane, led their Leducq Foundation for cardiovascular research, founded in 1996, until her death in 2013. 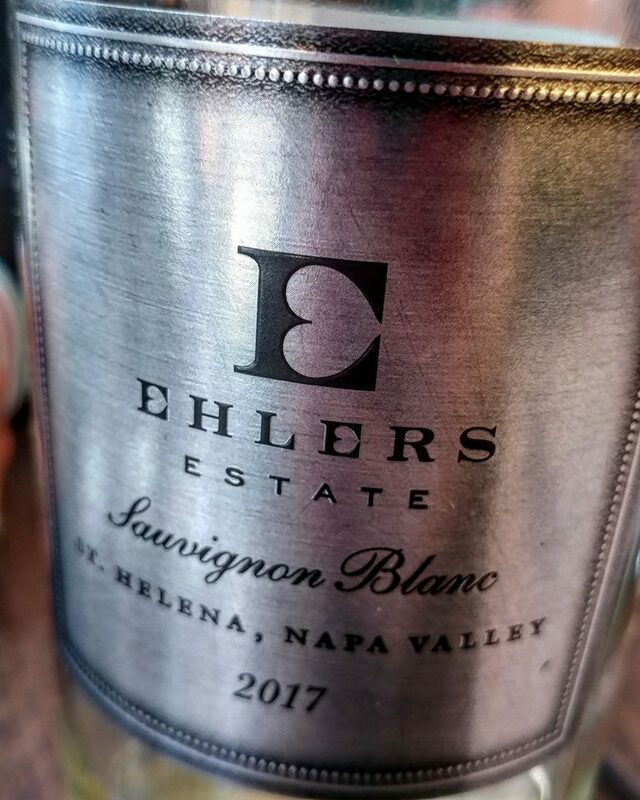 The Leducqs had sold all of their companies so they could place them in a trust to support their Foundation, but it was their wish that Ehlers Estate still continue to make the finest wines. It is a unique ownership situation where the winemaker, Kevin Morrisey, is free to run the winery without compromising its original ethical intentions that are aligned with his own, that involves the holistic viewpoint that humans and the environment are a single system, and a deeper view that living in our isolated bubble on the globe so we may prosper is an illusion – the only way to truly thrive is to open ourselves up so we can gain knowledge and support from each other. All of us wonder, more and more as time goes on, what will we leave this earth when we are gone? What will be our legacy? 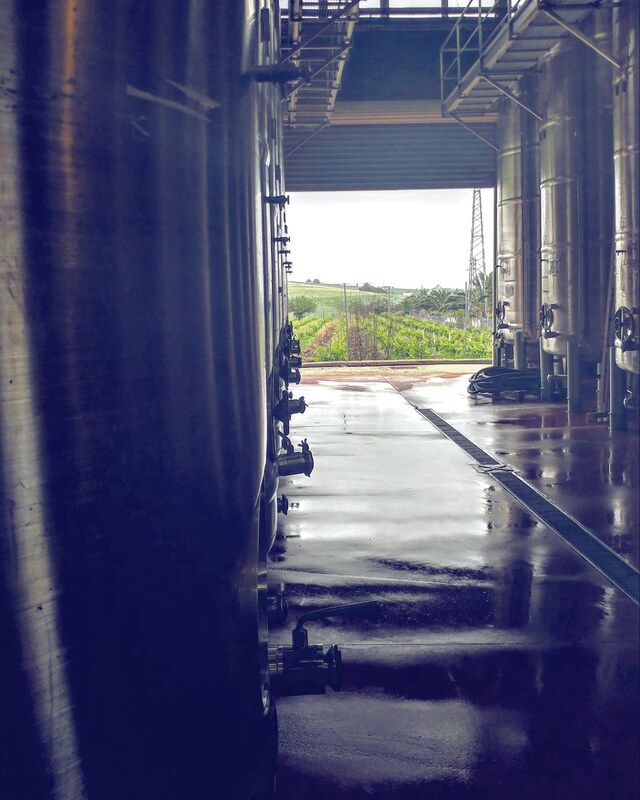 It fascinates me that the Leducqs wanted this winery to surpass them more than any other venture… it must have represented everything they found to be the best in the world. They were lucky enough to find the right person to pick up the baton to carry on the idea that we are only as good as the world that surrounds us. Now what baton will each of us pick up and carry, and ultimately which one do we want to remain long after we are gone? ***Top cover photo and first two photos in post are credited to Ehlers Estate. Kevin Morrisey’s goal is to make vineyard-driven wines with elegance and finesse that speaks of his values and high standards. –2017 Sauvignon Blanc, Saint Helena, Napa Valley: 100% Sauvignon Blanc. No intense green notes but plenty of zesty citrus peel with mango and orange blossoms yet still a nice amount of weight on the mid-palate. Impressive richness in body considering no oak and no MLF. –2015 Cabernet Franc, Saint Helena, Napa Valley: 100% Cabernet Franc. This Cabernet Franc is DANGEROUS! Complex, elegantly structured, generous and juicy, it is a wine that delivers on so many levels. The 2015 gives black raspberry fruit with toasted spices and fresh thyme on a fleshy body that has a nice backbone of acidity. –2015 Estate Cabernet Sauvignon, 1886, Saint Helena, Napa Valley: 92% Cabernet Sauvignon, 4% Cabernet Franc, 3% Merlot and 1% Petit Verdot. A great example of opulence and grace existing together with lush black cherry fruit and sculpted tannins that brought a stunning elegance to the feel of this wine with hints of espresso and smoky minerality that had a nice backbone of acidity carried through the long finish.